We’ve been growing dried beans for several years now. They store well and provide us with an easy source of protein. I like growing dried beans because of their dual uses; with the right varieties, you end up with at least two distinct harvests- an early harvest of green beans and a later harvest of dried beans when the seeds are mature. 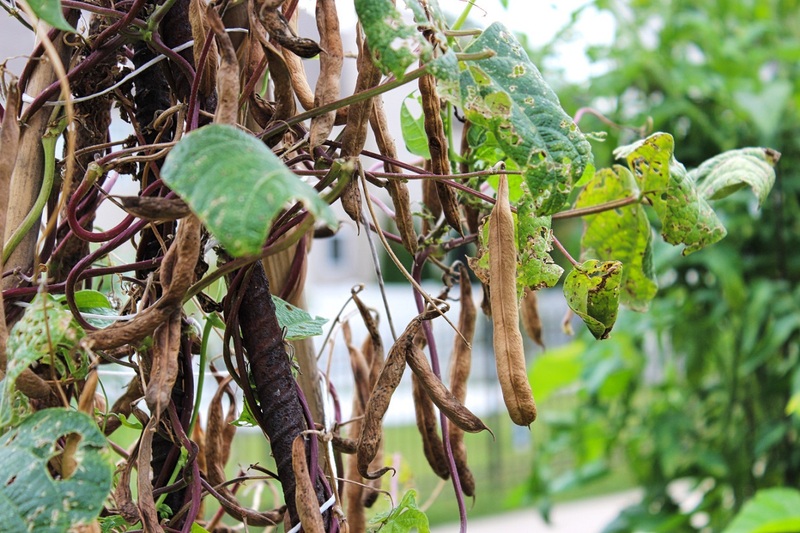 In the past we’ve grown Bolita beans (a type of pinto bean from Baker Creek), this Trail of Tears black bean, a type of cowpea, and even garbanzo beans (though they were less successful in our climate). 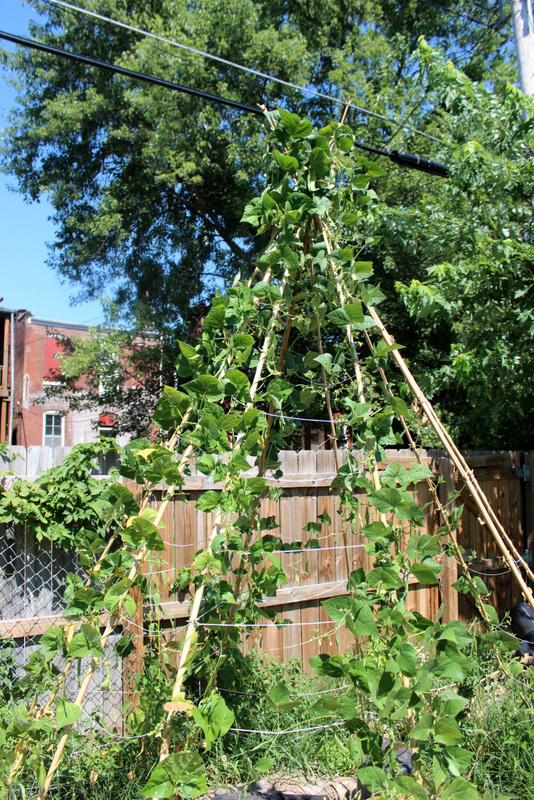 This year we only planted one teepee trellis of Trail of Tears black beans we had saved from last year. 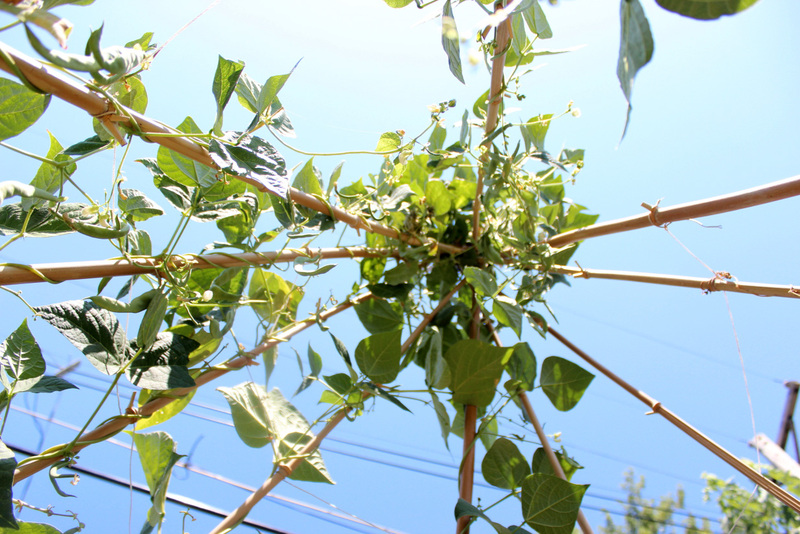 It’s a pole bean variety, so it likes to climb. 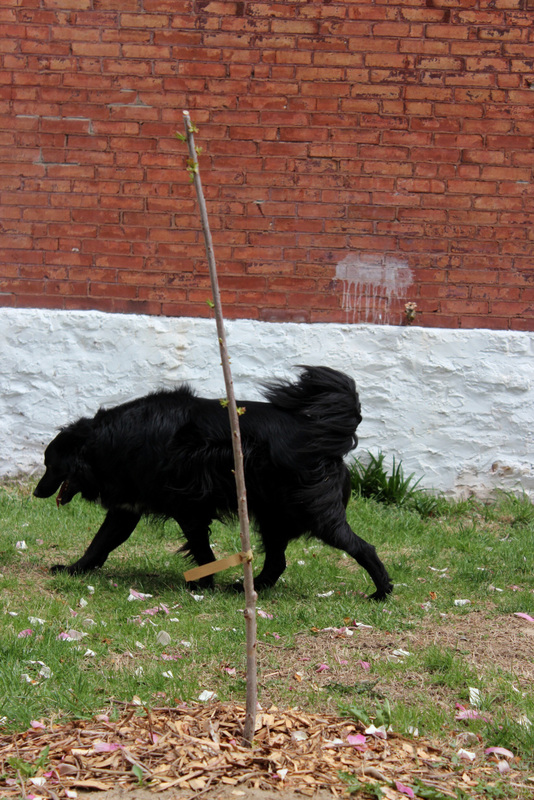 We constructed a simple teepee out of dried bamboo and twine and planted about 20 black beans around the base. 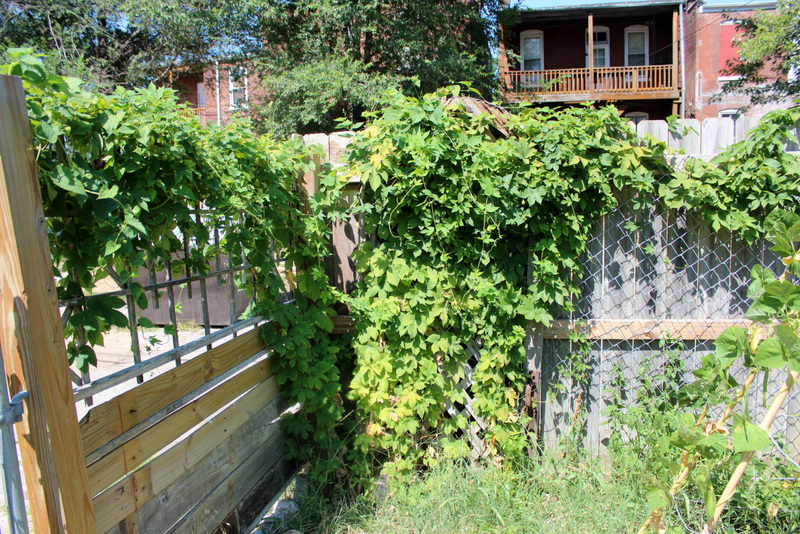 As you can see in the photo to the left, taken in late July, the vines completely overtook the trellis. 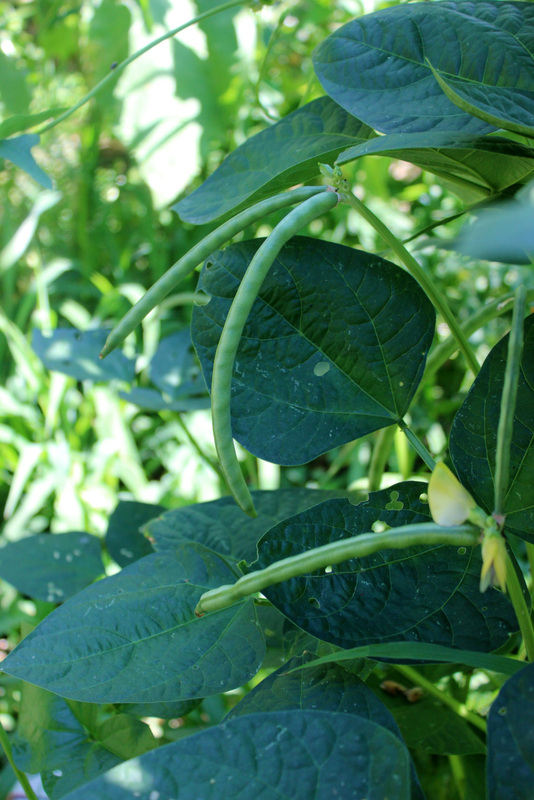 All green beans can be grown out to produce dried beans, and all dried bean varieties can also be eaten as green beans. 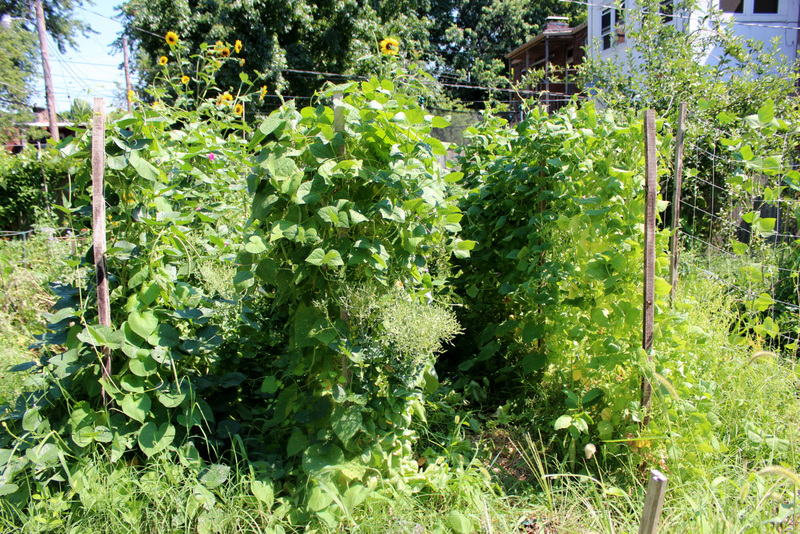 The trick is finding the right combination- some are great only as immature green bean pods and some are only good as dried beans, with the pods too stringy or woody to enjoy early in the season. 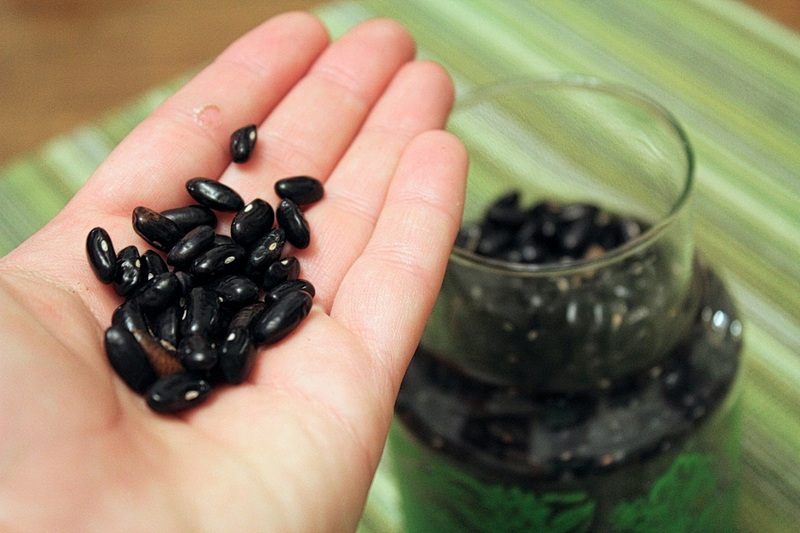 We like this variety of black bean because it produces early, immature pods that are tender enough to be eaten as green beans as well as a hefty harvest of dried black beans. 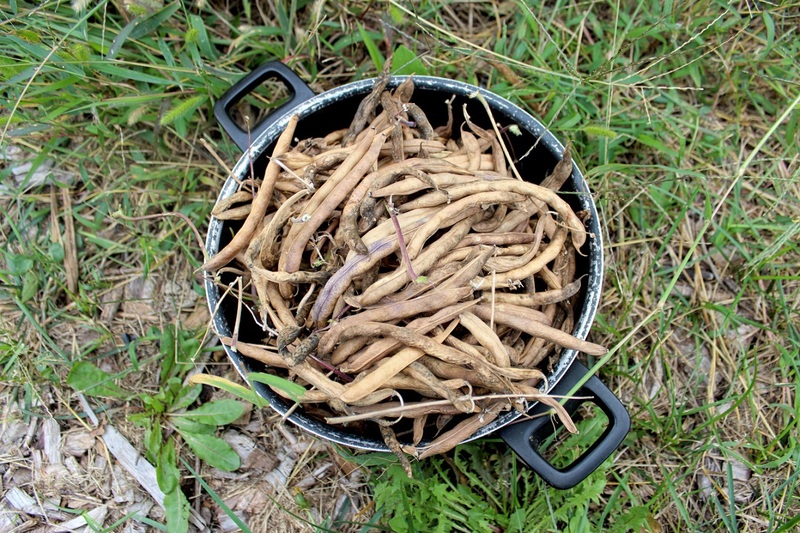 This year we grew Kentucky Wonder and Dragon Tongue beans as green beans and allowed most of these black beans to dry. 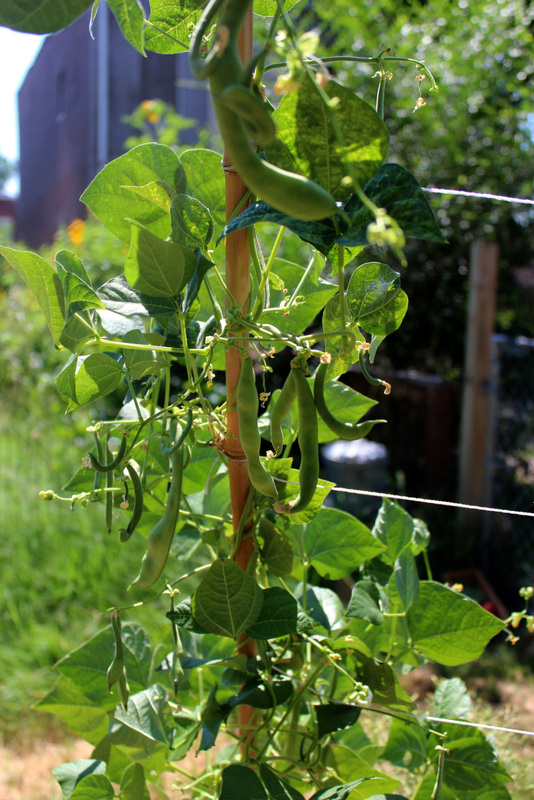 If you’ve ever grown green beans, you know there’s a short window for harvesting before the beans in the pods get too big, and consequently too tough to eat. 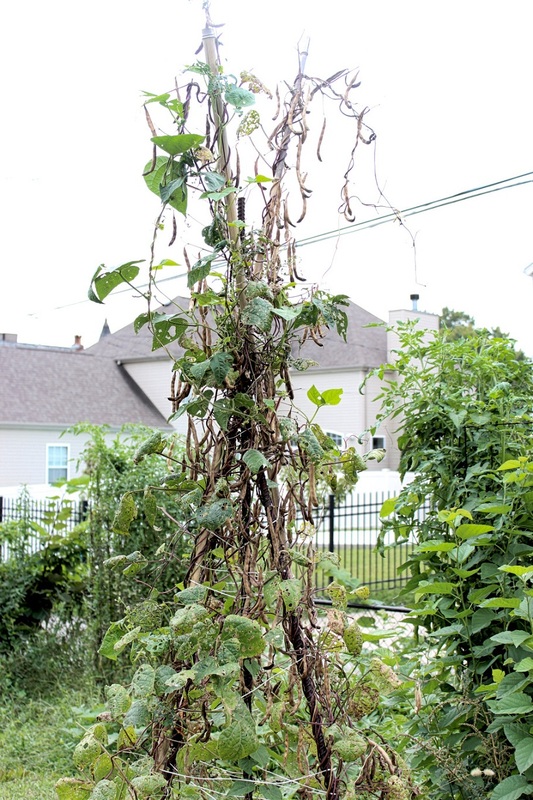 To save dried bean seeds (this includes saving seeds for green bean varieties), you want to allow the beans to fully mature and dry on the vine. For us, this took until late August. 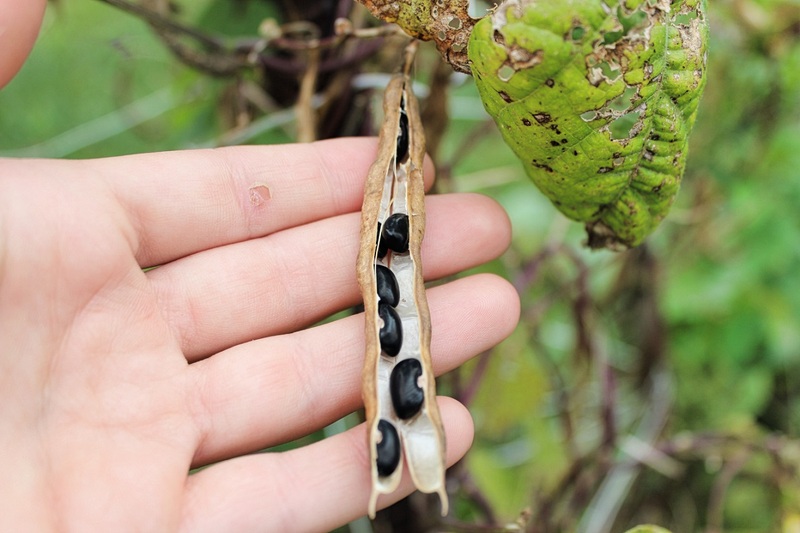 Beans are ready to harvest when the pods are completely dry- when they crack instead of bending when you try to open them. You can test a few and take a look at the beans, if they feel hard and look like fully-formed beans you’re ready to go. If they feel soft at all, let them mature a little longer. If you time it out right, you can get another flush of beans before it gets too cold. 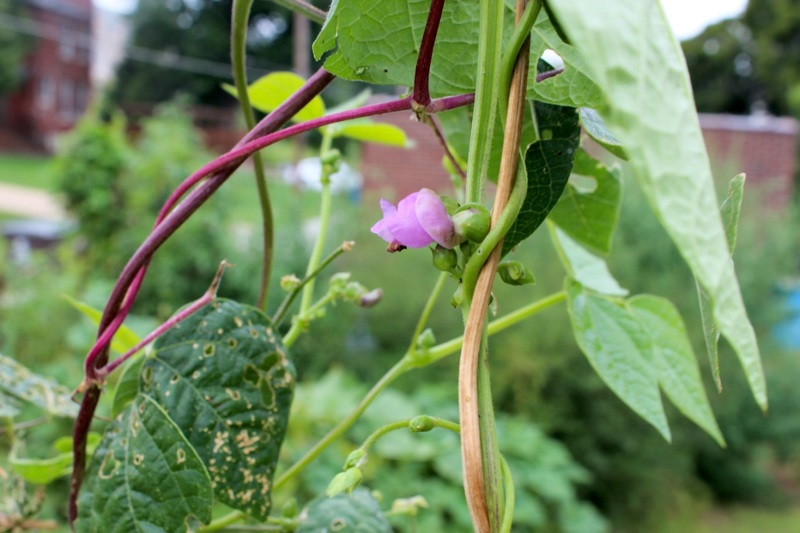 Some of our black bean vines are just starting to put out new flowers, so we’ll probably get a handful of green beans out of it. There probably won’t be time to let them grow and dry on the vine before frost kills it off. 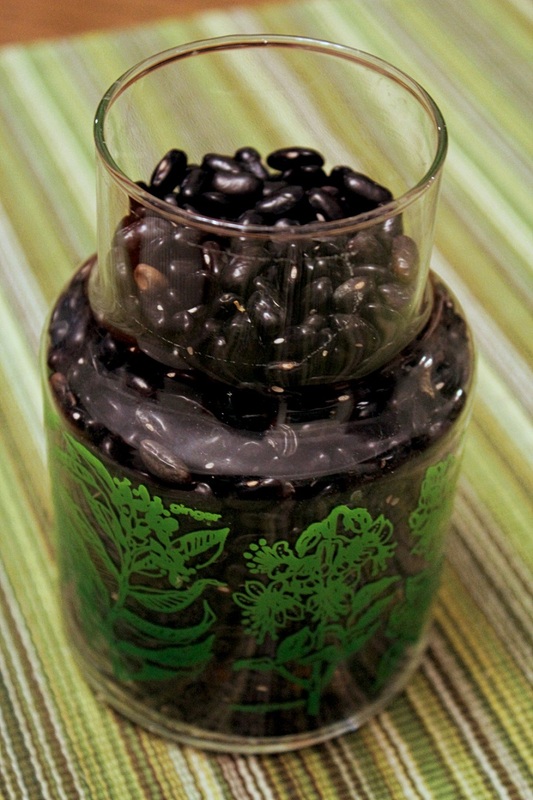 I harvested our black beans last week, and Eric and I slowly shelled them day by day. It can be a tedious task, opening each pod individually, though if they’re dry enough you can shake them in a paper bag to dislodge a lot of the beans. Even with careful hand-shelling, you still end up with some debris, or chaff, which we easily winnowed away by pouring the beans slowly from one container into a large sifter in a slight breeze. The beans poured down while the lighter chaff floated off in the wind. The sifter allowed us to further separate out the beans from the smaller particles. From one teepee trellis we got about 3 cups of black beans. That won’t last us through the winter, but it’s a good start. Definitely planning on growing a lot more next year! It makes sense to save seeds. We love looking at seed catalogs each year and ordering new varieties or things we’ve never tried before, but it’s even more satisfying to look at our own seed collection. Saving our own seeds each year is economical, plus it gives us the power to select for traits of our choosing. By saving seeds from the best tasting tomatoes, or the ones that ripen first, or those from plants displaying the best disease resistance, we’re breeding from generation to generation the best plants for our purposes and climate. This kind of control has been systematically stripped from lots of farmers through the sale of hybrids and genetically modified crops, from which seeds cannot be physically or legally saved. Anyway, saving tomato seeds is pretty easy, if you know what you’re doing. 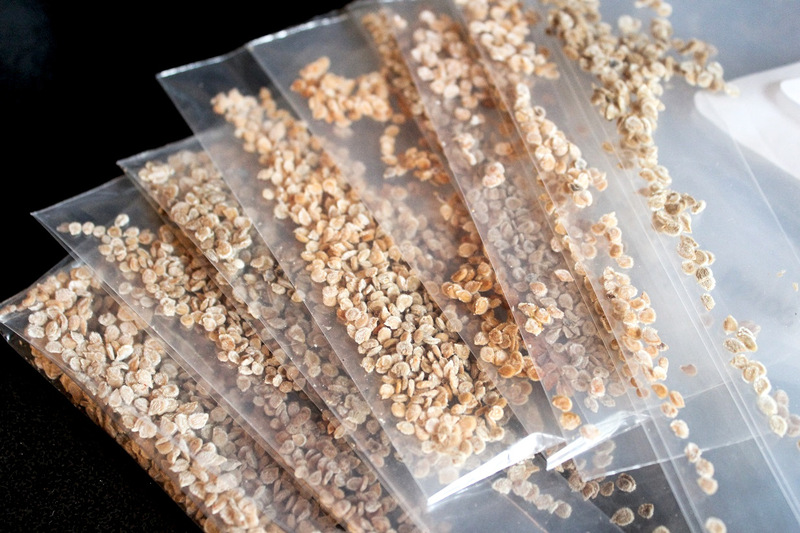 The hardest part of seed saving is ensuring a “true to type” second generation- meaning the resulting plants will be genetically similar to the parent plant(s). 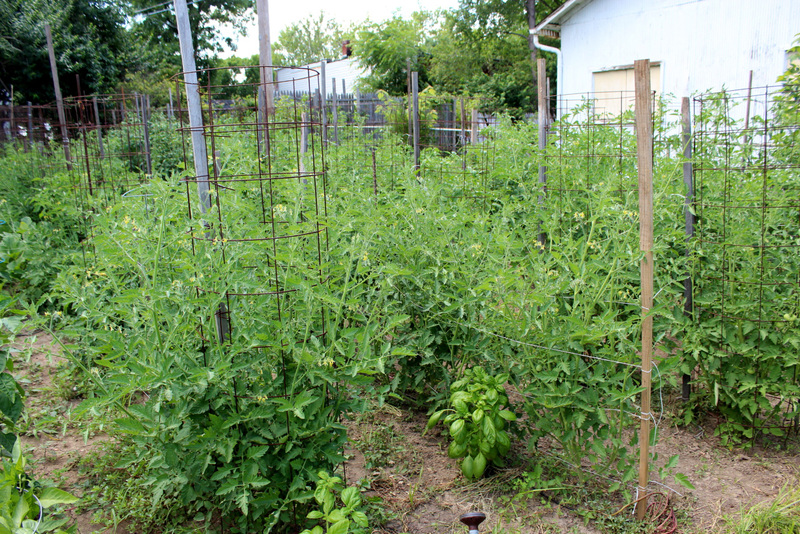 The good thing is tomatoes are largely self-pollinating so it’s unlikely you’ll get unwanted hybridization or cross pollination, even if multiple varieties are planted in close proximity. So saving seeds from any non-hybrid or non-GM tomato will most likely result in a “true” plant. The other great thing about saving seeds from tomatoes is that you still get to eat the fruit! 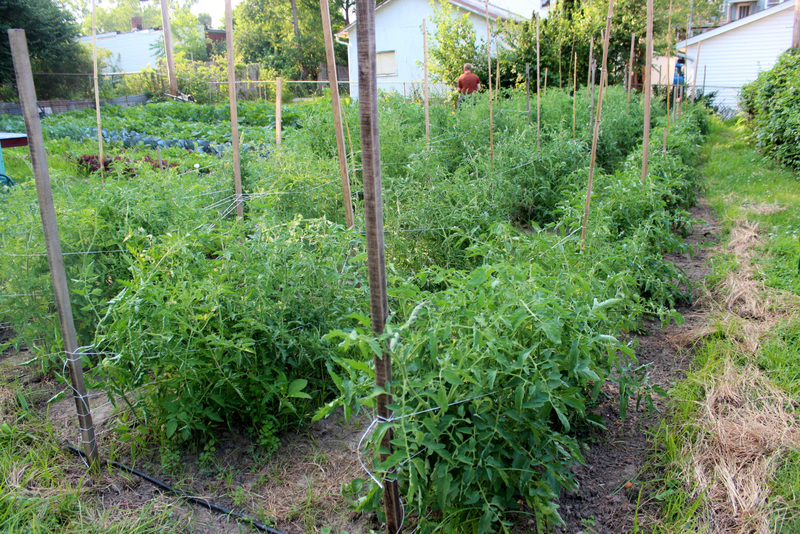 Lots of times the crop itself must be sacrificed for the seeds (like allowing greens to bolt), but not tomatoes! To save tomato seeds, you can simply remove the seeds, allow them to try, and package them up for next year. However, it is highly recommended that you ferment the seeds first. 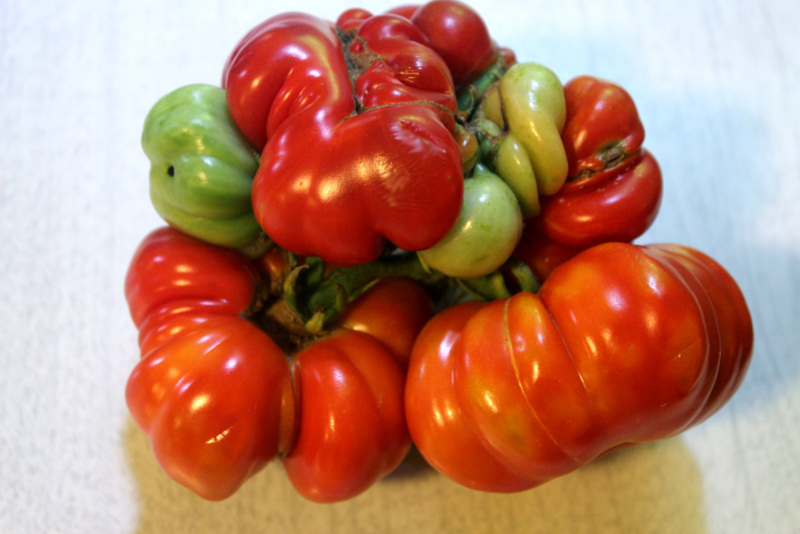 You know that gelatinous coating around tomato seeds? 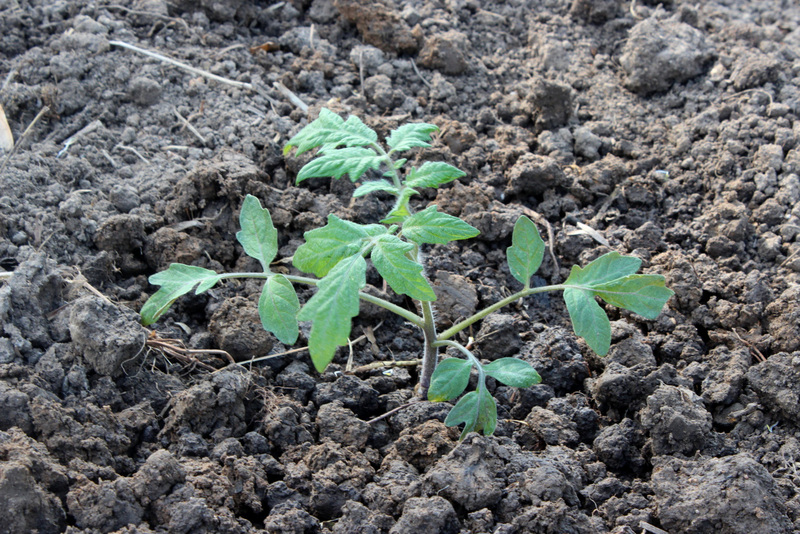 It inhibits seed germination inside the tomato, which normally provides a rather alluring dark, moist environment for seeds to start growing. Fermenting the seeds removes that coating, reduces seed-borne diseases in the next generation, and helps you separate the good seeds from the bad. 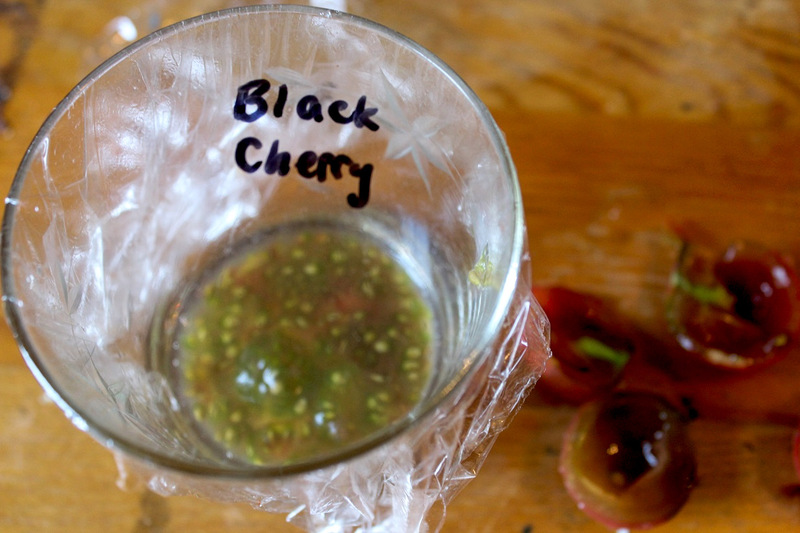 Fermenting the seeds is easier than it sounds! 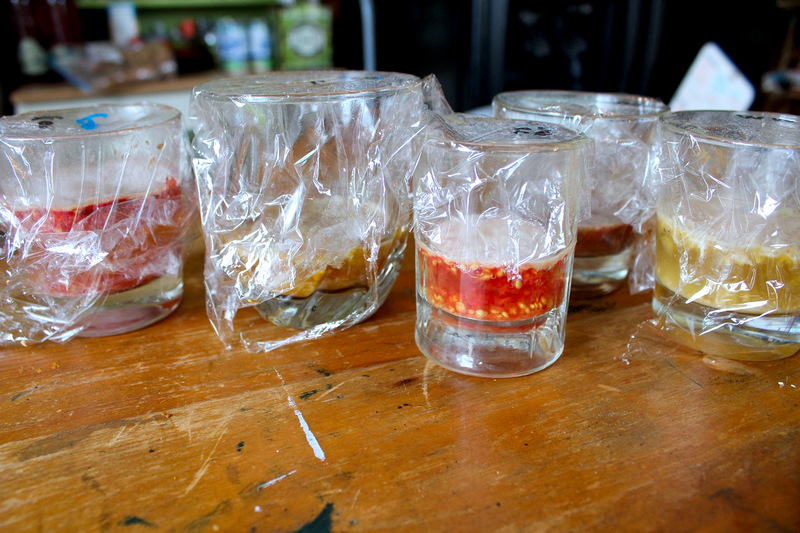 Simply squeeze the seeds and goo out into a small cup or dish (I’ve even used shot glasses). Don’t worry about getting some tomato flesh in there, you’ll get rid of it later. If there’s not much liquid or gel you can add a little water, but not too much! Loosely cover each container with plastic wrap. Some people recommend keeping them open or poking holes in the covering, but that can be a recipe for fruit flies. As long as there’s a little breathing room, you’re good. Don’t forget to label! I use a permanent marker to write directly on the plastic wrap so there’s no confusion. 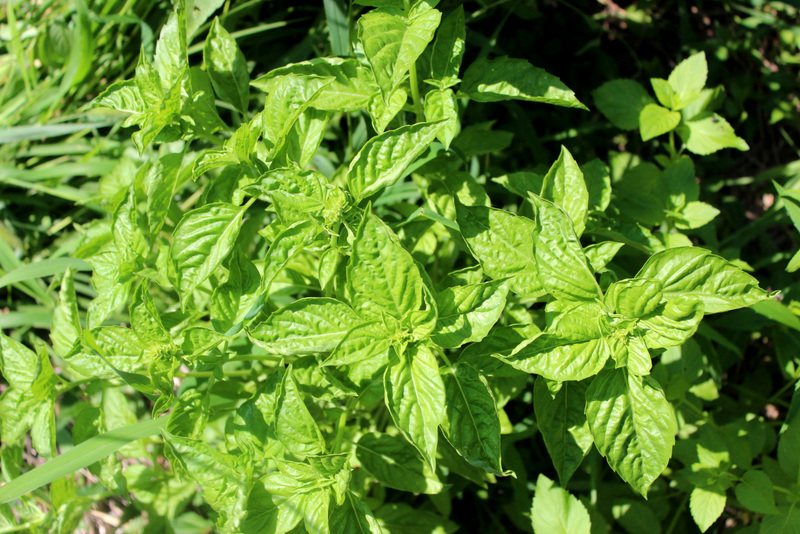 Once labeled, put in a draft-free spot out of direct sunlight for a few days. Depending on conditions inside your house, you should see a layer of mold begin to form after 2-3 days. You probably don’t usually rejoice at the sight of mold, but this is a good thing! It means that the protective gel is breaking down. 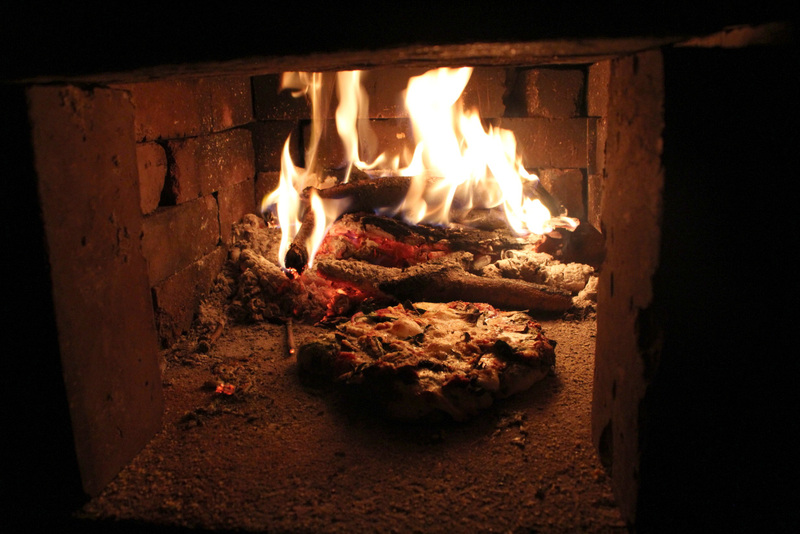 In a way, the fermentation process is mimicking the natural action of a tomato rotting on the ground. In nature, the seeds don’t become “active” until after the fruit has rotted. After the mold forms, you get to start a process of decanting to remove the mold and unviable seeds. Fill your container up with water. The good seeds will sink to the bottom, and any bad seeds will float. Allow to sit for a minute, then slowly pour the water into your sink. 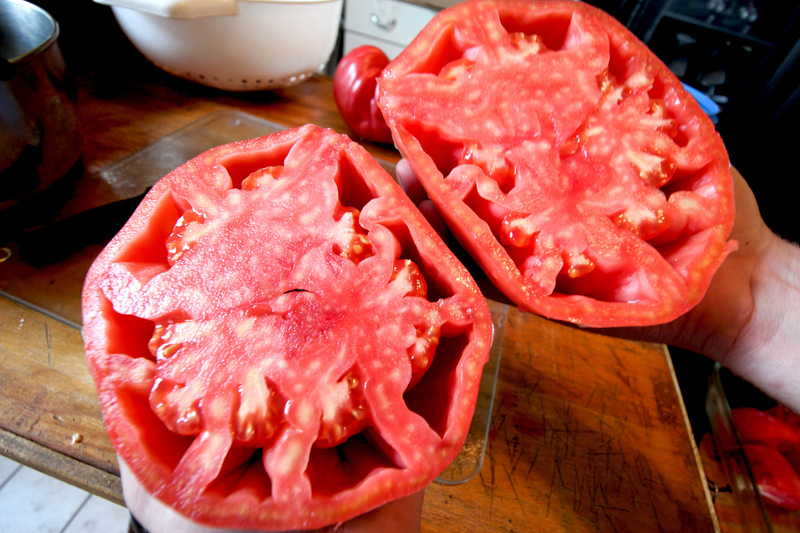 You’ll notice you’re pouring off any tomato pulp and bad seeds with the water. Refill with water and decant until you have clean seeds. The last step is drying. Some people prefer to use screens or paper plates to ensure even drying, but I like to use ceramic dishes. 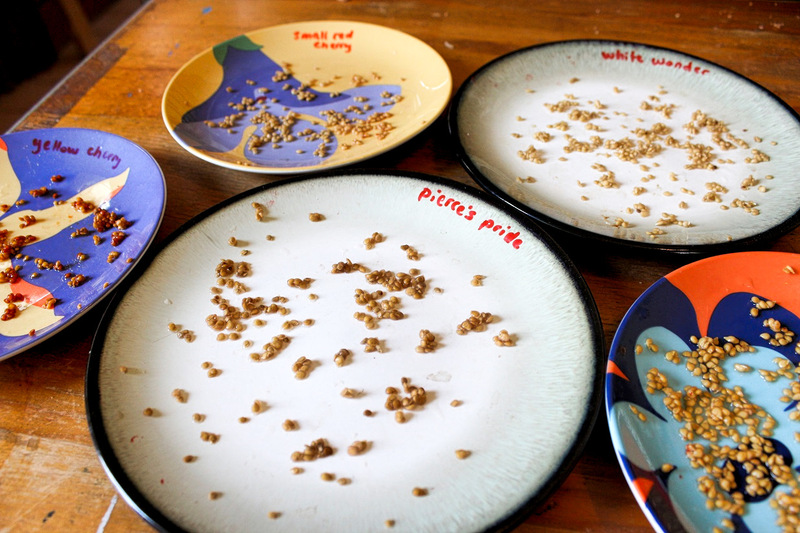 If you move the seeds around occasionally you shouldn’t have a problem with them sticking and breaking, plus the plates allow you to keep varieties separate. I like to label the plates with non-toxic dry erase marker, which cleans off easily. Keep them out of direct sunlight and monitor for moisture daily. You’ll know when your tomato seeds are sufficiently dry. They’ll get a slightly fuzzy outer texture. They should break instead of bending, if you feel like sacrificing one of your seeds. It’s a good test, especially if you’ll be storing them long term (mold was good in fermentation, but not in storage) or in the freezer. We store our seeds inside biodegradable plastic bags in a dark cabinet in our basement. Many people use paper envelopes to ensure for proper breathing and to prevent moisture buildup. No matter how you choose to store your seeds, it’s always a good idea to label them with the variety, the year, and location of harvest. 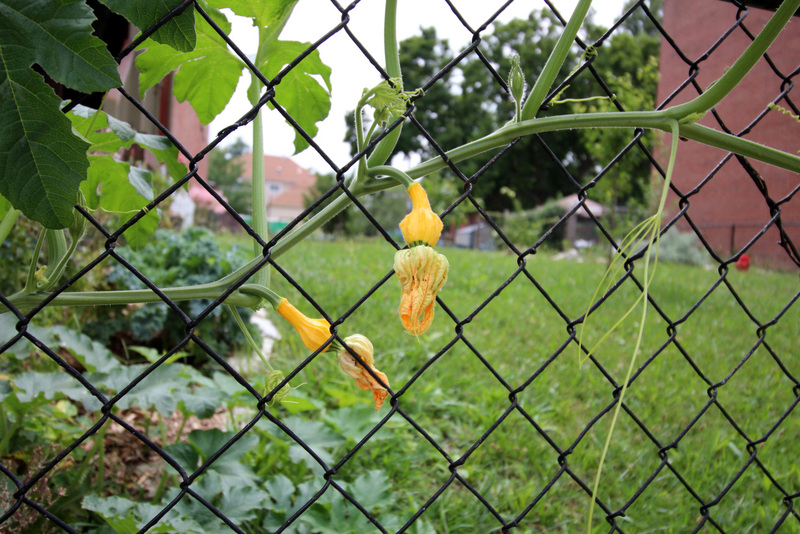 Last year I started a free community seed library at Local Harvest Grocery, which you can read about here. 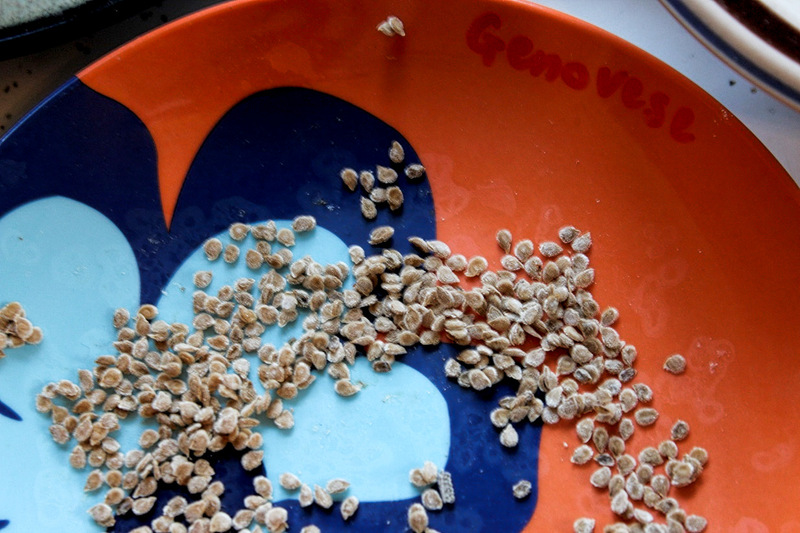 Anyone can “borrow” seeds with the pledge to save and return some for the next year. 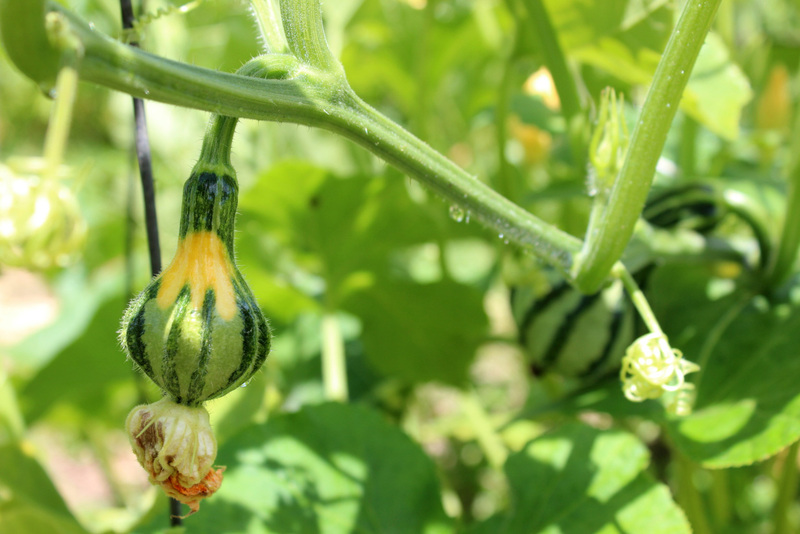 As more people participate, we’ll grow a diverse collection of seeds that thrive in our area. If you live around here, feel free to stop by for some seeds, literature on seed saving, or just a friendly chat 🙂 As you can tell, I love nerding out about seeds! Our house is situated on about 1/3 of an acre, with a large double lot to the east and a smaller single lot on the west side of the house. 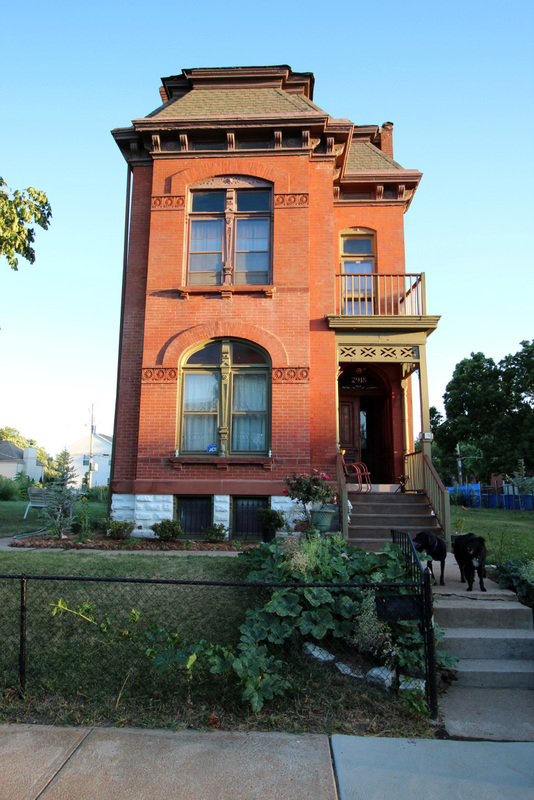 Here’s our house! This is looking south, so the East double lot is on the left side, the West lot is on the right of the photo. From the back of the West lot, looking North over some weeds. Back of the West lot, by the garage and shed, looking south to the alley. This is where we had planned to build a new chicken enclosure. 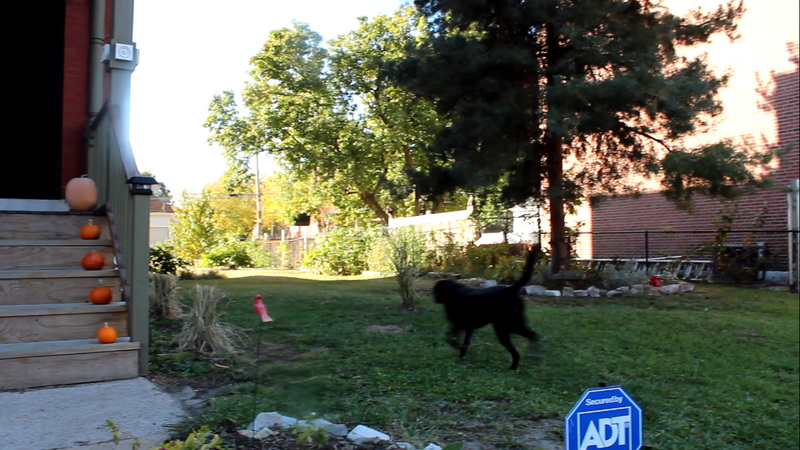 The first thing we did in our new yard? 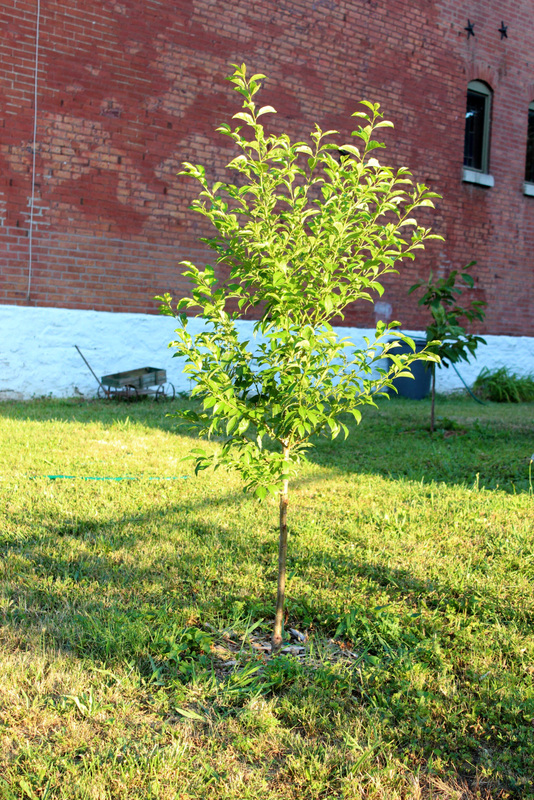 Start an orchard in the West lot. 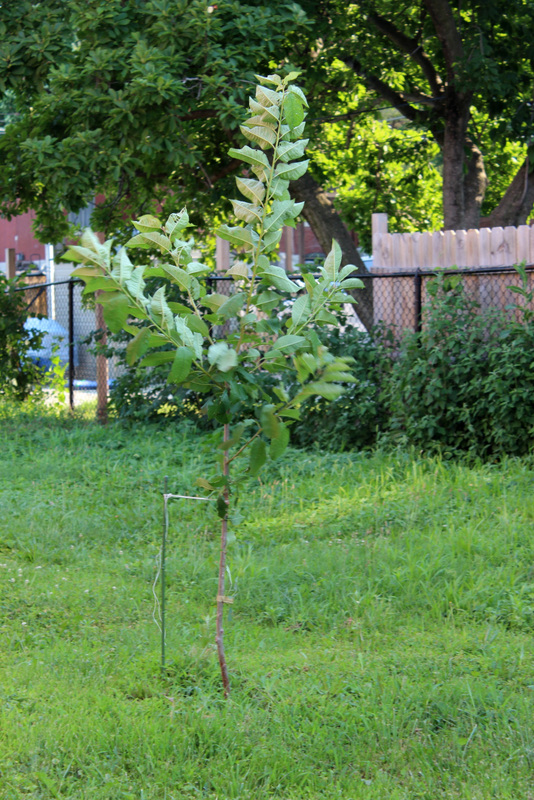 There was already a 3-4 year-old peach tree over there, and we wanted to add to it. We ordered the trees online soon after we moved in last September, but they weren’t delivered until November. So we planted our trees right before Thanksgiving 2013. 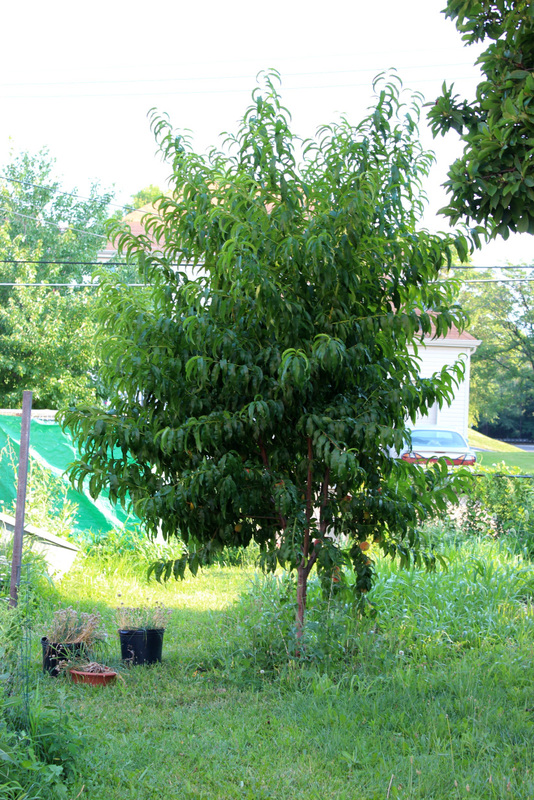 Two plum, two cherry, three apple, and one peach tree to go along with the one already there. We worried that the trees wouldn’t make it through the worst winter we’d seen in a long time. 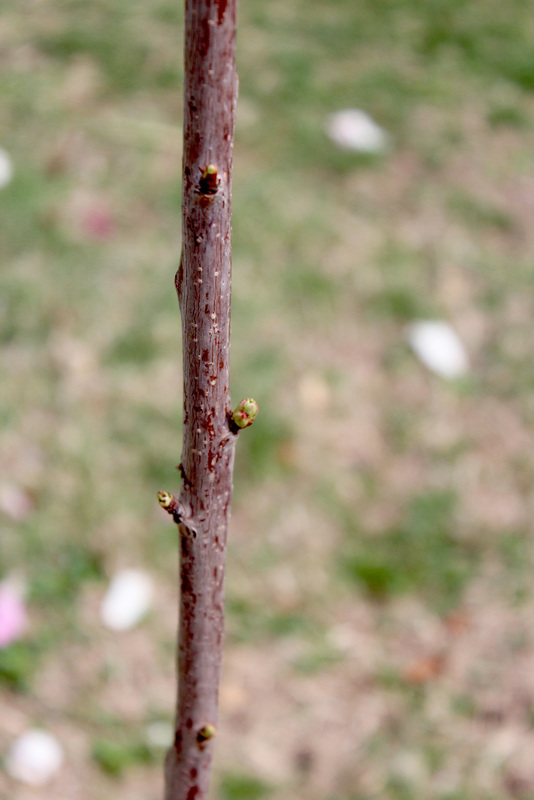 Come spring, though, we started to see some signs of life. 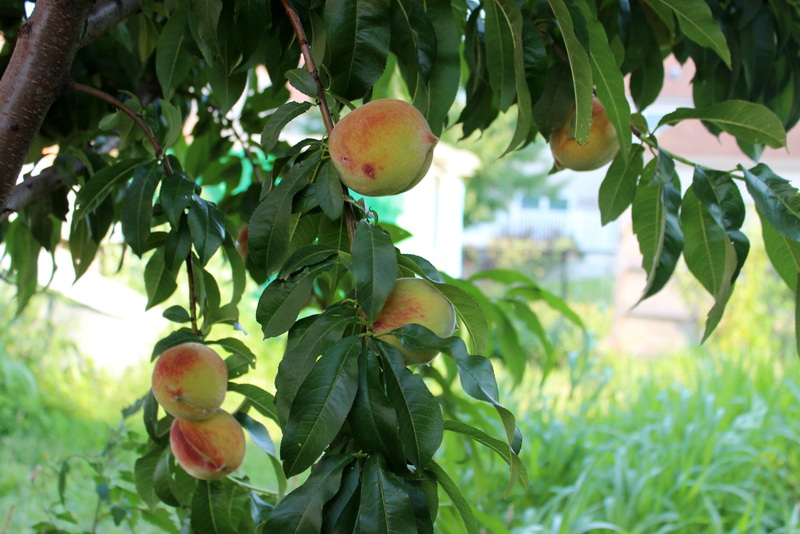 The peach tree we inherited. We got enough peaches to eat fresh, share with friends and family, and make 3 pies. Not bad for our first year! 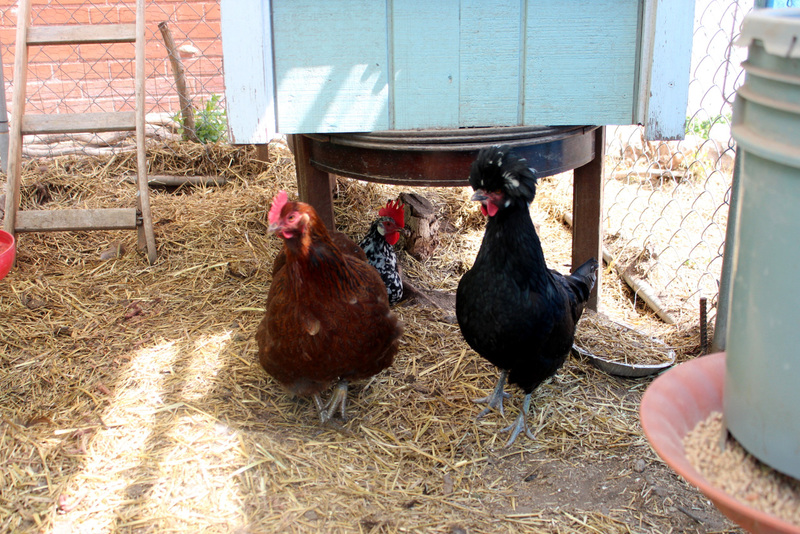 The second thing we had planned was to build a new chicken coop and enclosure. Sallie was nice enough to keep the chickens in her yard after we moved out. We wanted to build a new home for them but ran out of time before it got too cold and the ground froze. So we moved them into our yard using the same chain link pen and dog-house-turned-chicken-coop set up, seen wrapped in the green tarp in the photo below. Here’s a view of the West lot from the front as of today (our house is on the left). The trees up front are plum. 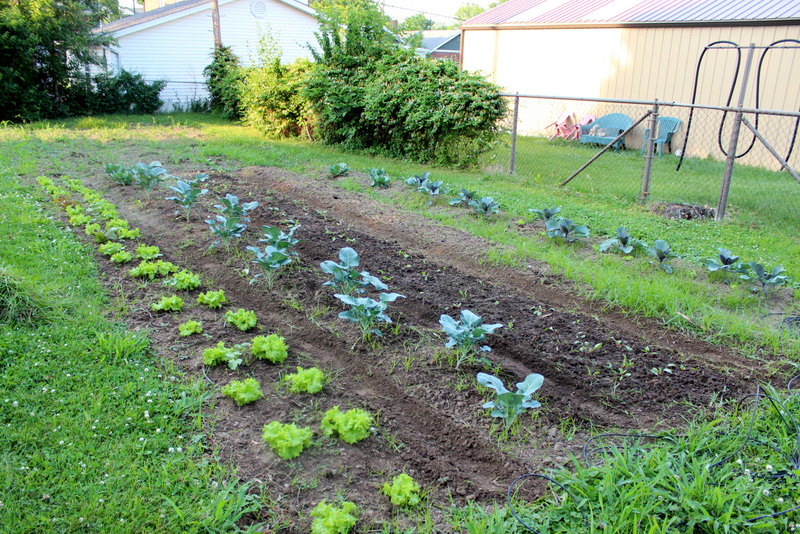 We worked the soil and replanted the old, overgrown garden plot with lettuce, salad mixes, Red Russian kale, lacinato kale, and romanesco. 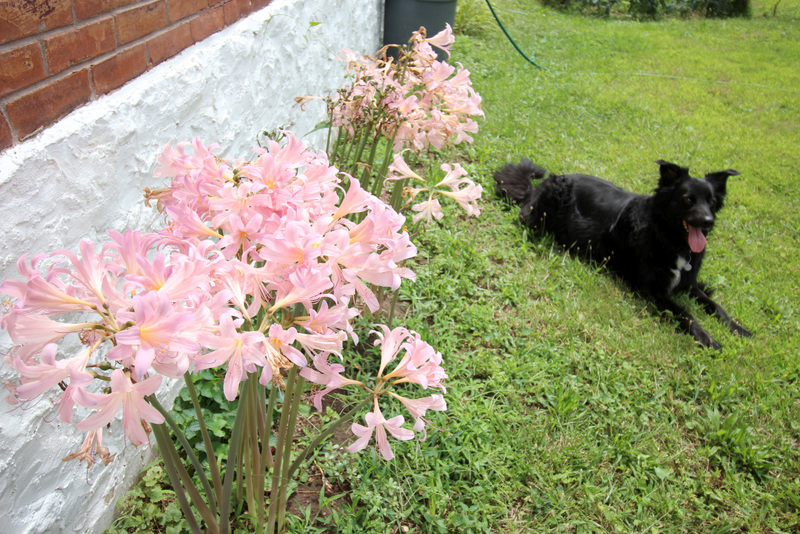 Surprise lilies next to the house. 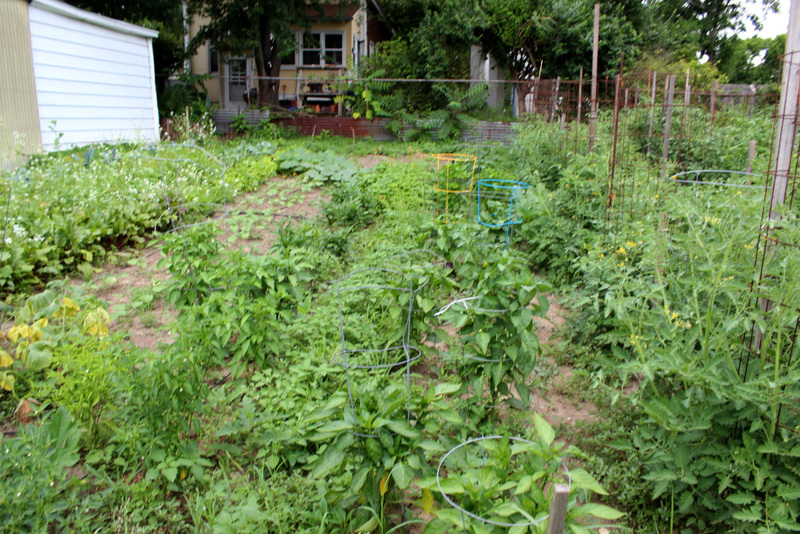 Our plan for the rest of the yard: more food production. 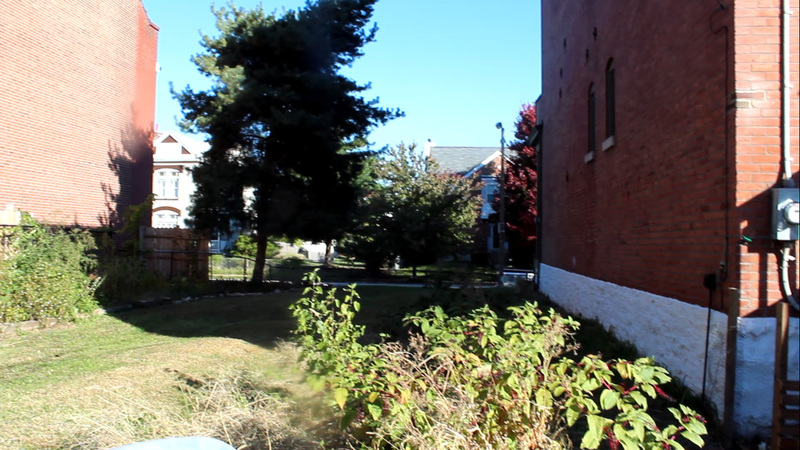 We’ve got big plans for the future, including a food forest, outdoor kitchen, and a water feature. 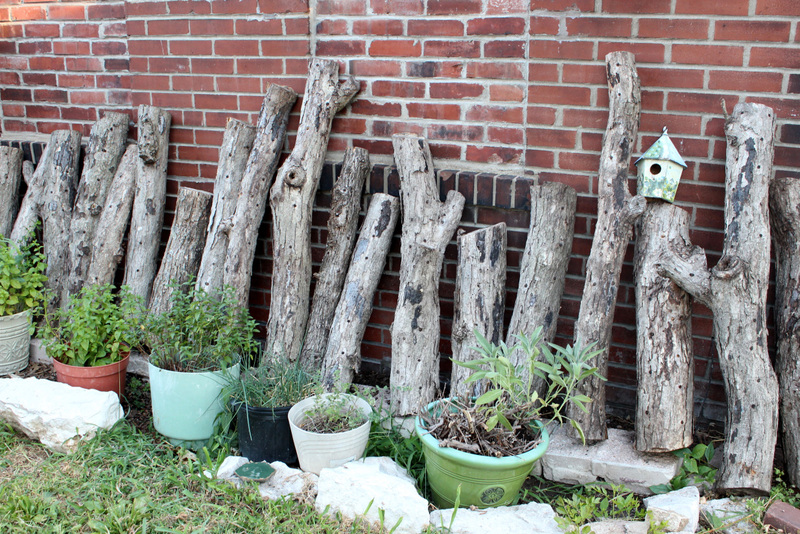 We leaned our mushroom logs against the North side of the garage and got some shiitakes this spring. 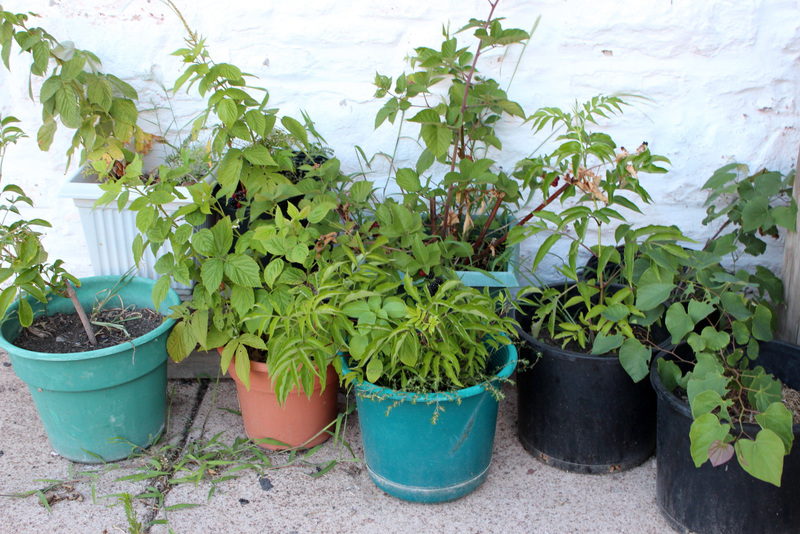 We also have lots of herbs in pots until we find the right spots for them. Our future berry patch, also housed in pots for now until we find the right spot! Elderberry, raspberry, and blackberry. We’re planning to till up and farm a large section of the east lot, but for now it’s mostly lawn. We got rid of the dead yews and started a small garden in the back for this year. 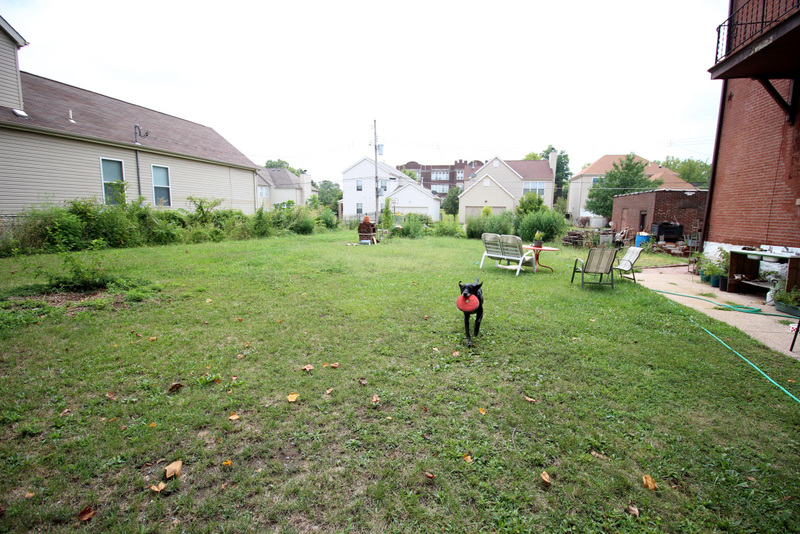 View of the East lot, with Maggie and her beloved frisbee. The new garden space in the back. We planted some of our extra tomato plants. 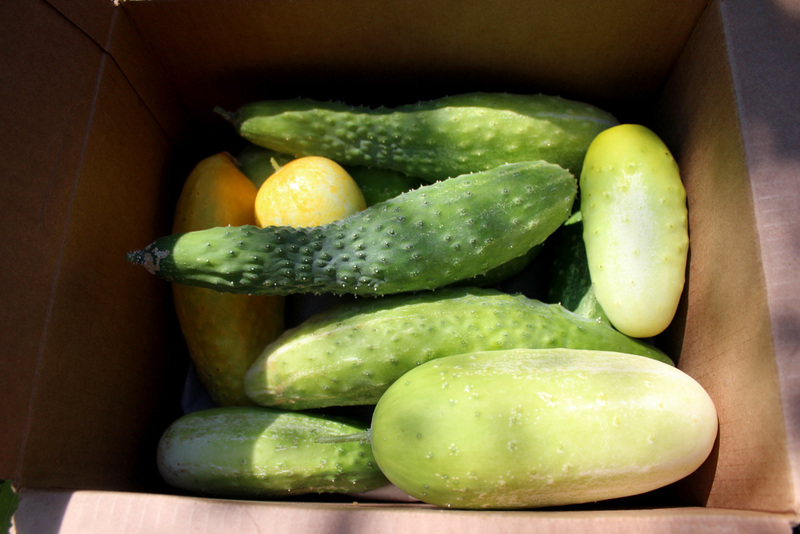 More wild gourds. It’s been really interesting to see the differences in this second generation. Some are much darker and even striped! 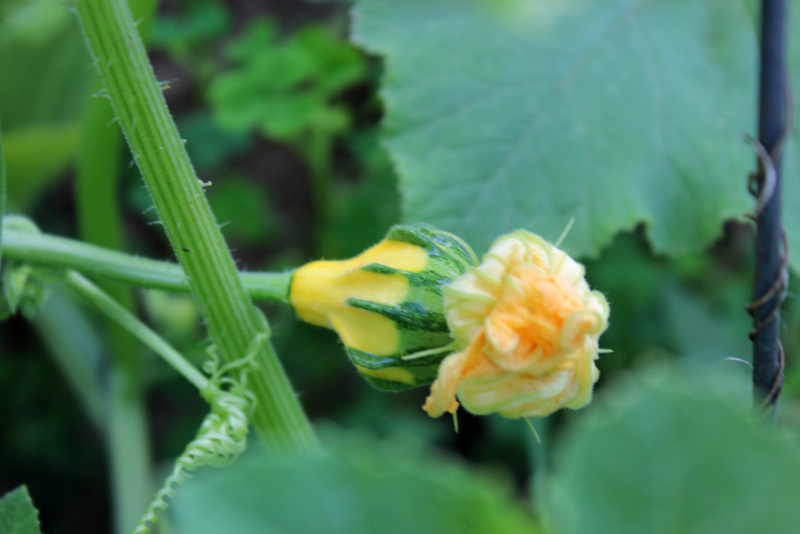 We are also growing pumpkins, watermelon, zucchini, bush beans, pole beans, and basil in the back. 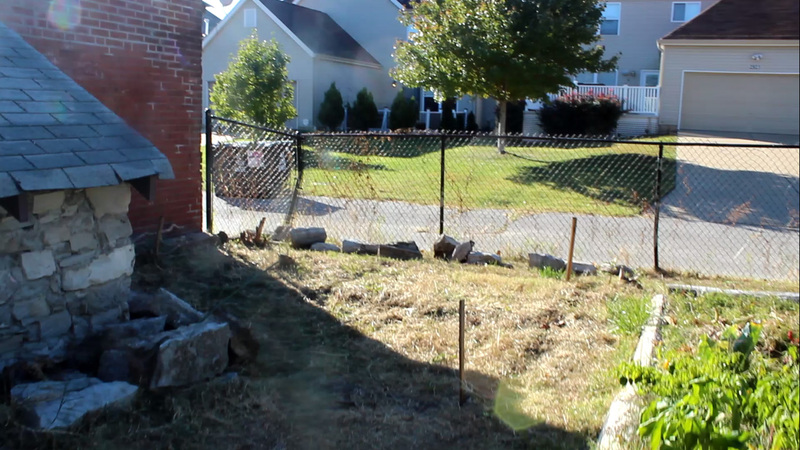 The rest of the East lot is mostly grass, though Eric did decide to build a brick pizza oven on a random brick pillar that was already in the middle of the yard. 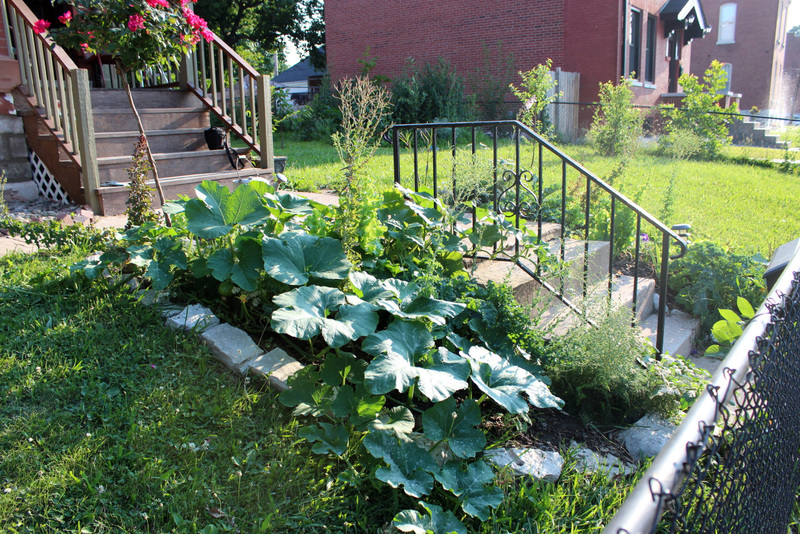 We landscaped around the side and front of the house a little more formally, but didn’t lose our sights on edibility. We transplanted feverfew, mint, oregano, asparagus, sage, thyme, echinacea, azaleas, and a blue cedar tree (the calla lilies were already there). There are two patches along the front steps down to the sidewalk that we dug up and replanted as well. 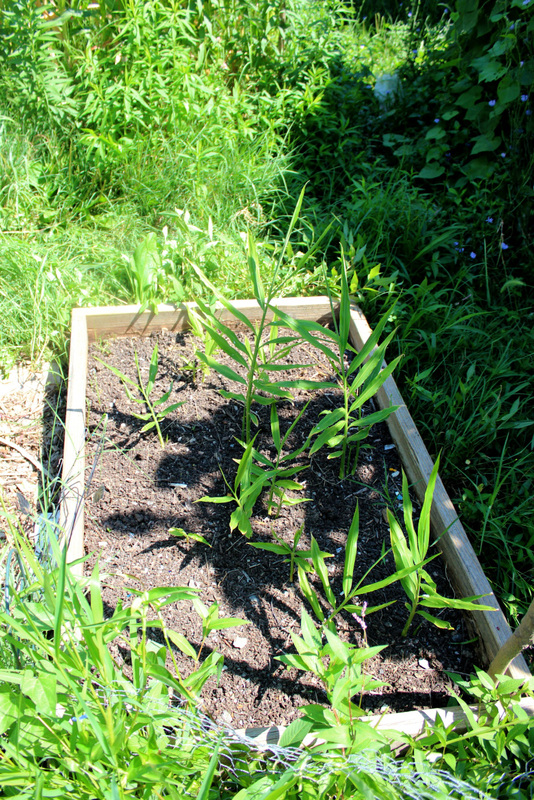 We transplanted some yarrow we had grown at Amy’s last year, as well as some bibb lettuce, curly kale, and a few wild gourd plants. There was already a weird rose tree there. 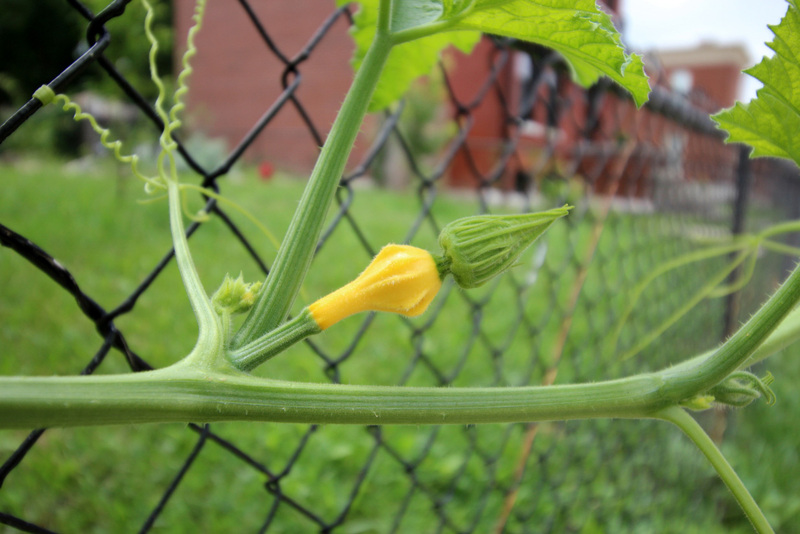 Wild gourd growing on our front fence. 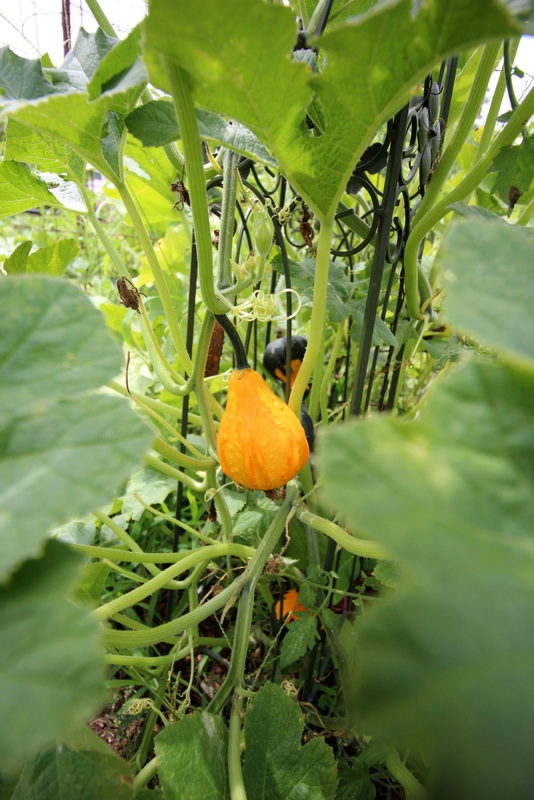 A volunteer pumpkin took over one of the little plots. Again, lucky us! We’ve been away from the blog for a while because things have been so busy with our house and gardens. 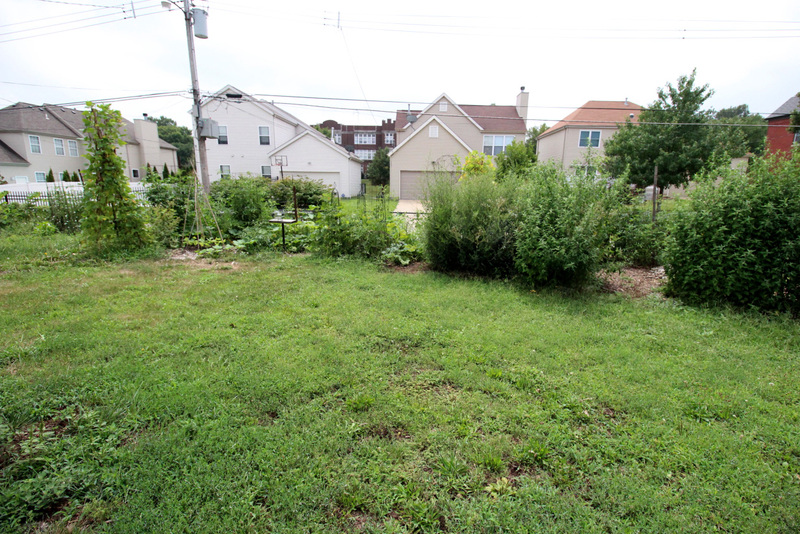 Since buying our home last year, we’ve been focusing our efforts on the house and yard, and our garden at Amy’s place. 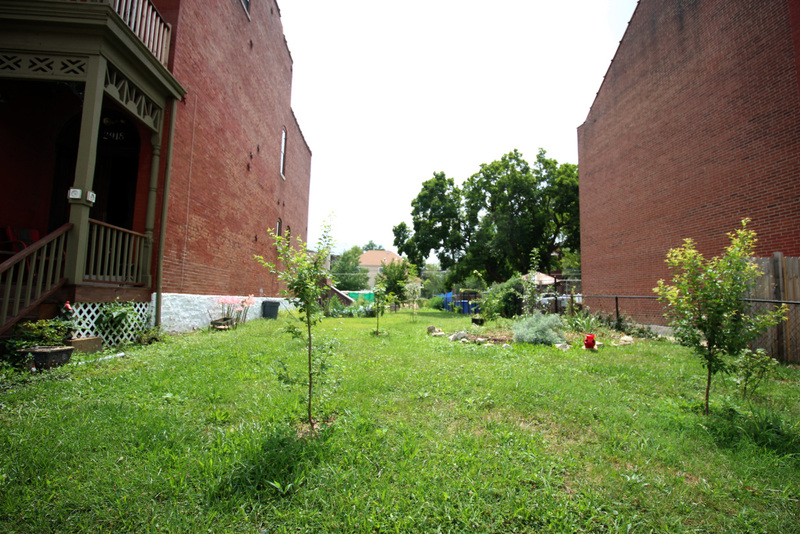 We are no longer utilizing our former satellite gardens at Sunset Hills, Iowa Ave., Sallie’s side yard, and Lafayette Square. 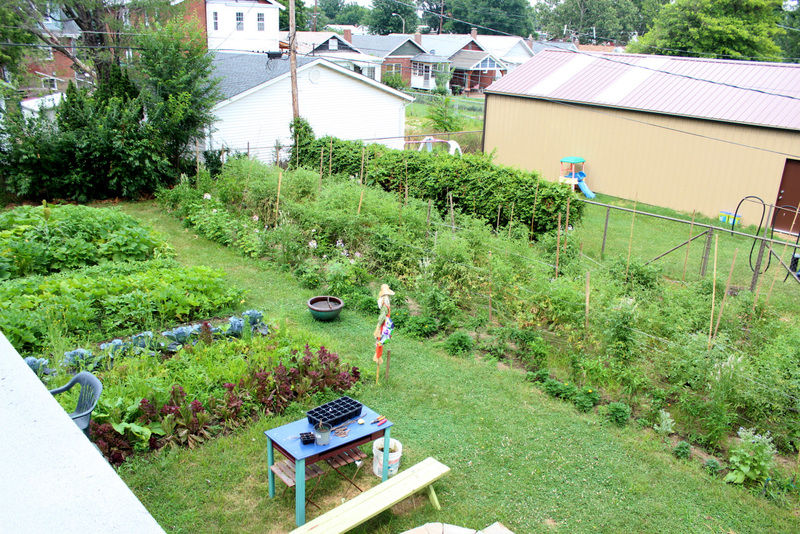 So here’s finally an update on the garden at Amy’s! We got a later start than we would’ve liked this year due to a cool, rainy spring. 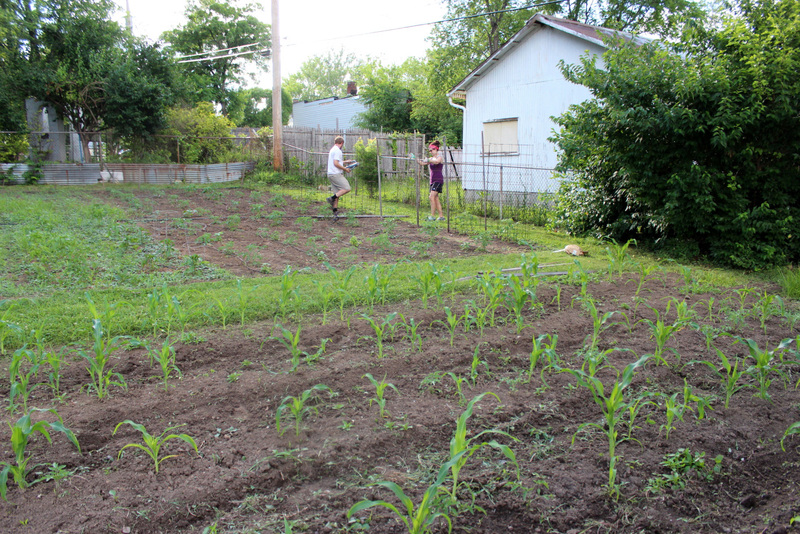 Once it dried a bit, we were able to get our two plots re-tilled and planted quickly. In the future we’d love to rely less on tilling (or combine it with the use of a cover crop) but it was absolutely necessary this time to remove the grass and weeds that had already taken root. The irrigation system is still in place, but it’s been mild enough that we haven’t turned it on yet. 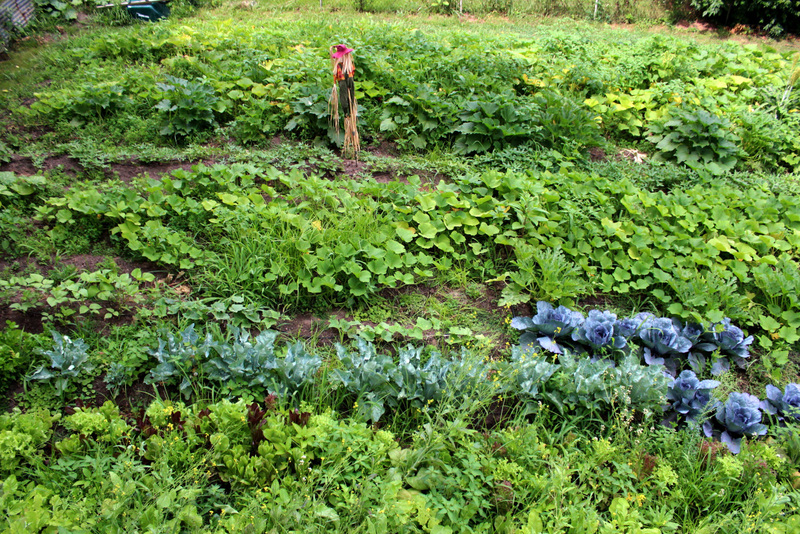 We’ve rotated our crops a bit from last year to promote soil fertility and reduce pests and disease. 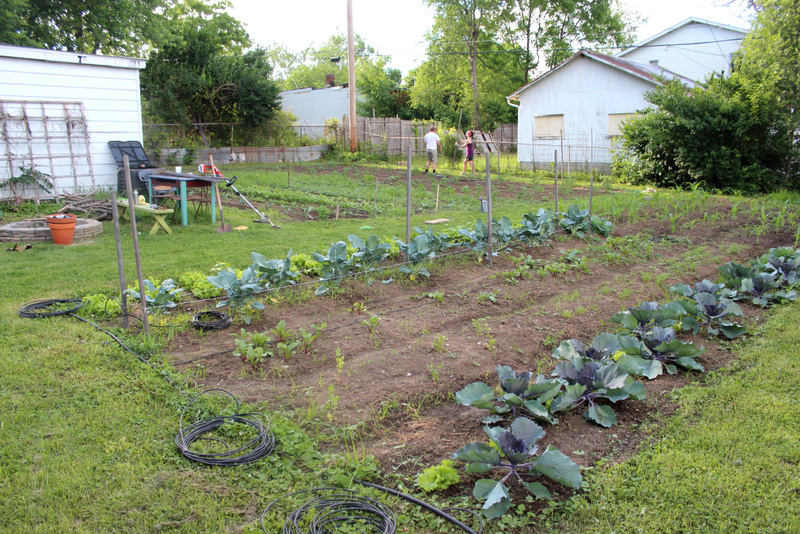 In the east plot, pictured below, we seeded beets, carrots, bush beans, and Peaches and Cream sweet corn, and transplanted some volunteer black seeded simpson lettuce, and broccoli and cabbage from Bowood Farm. 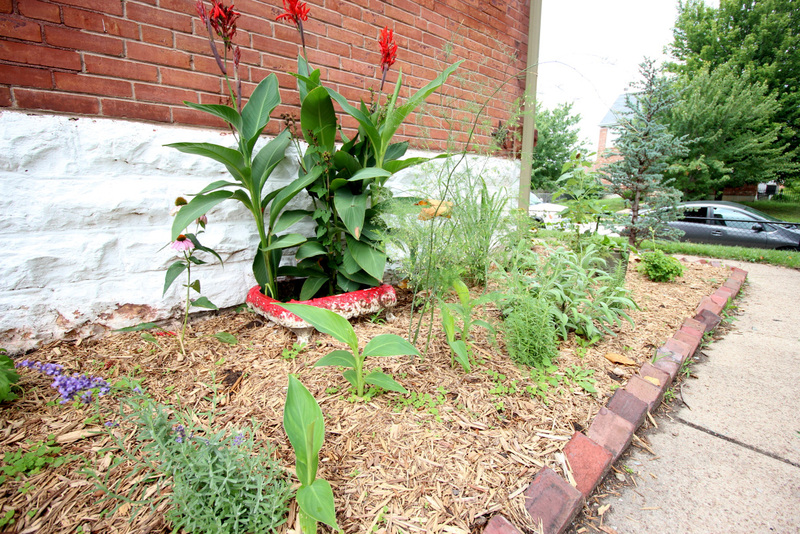 There are also quite a few volunteer tomato, borage, celosia, marigold, and cleome plants from last year. 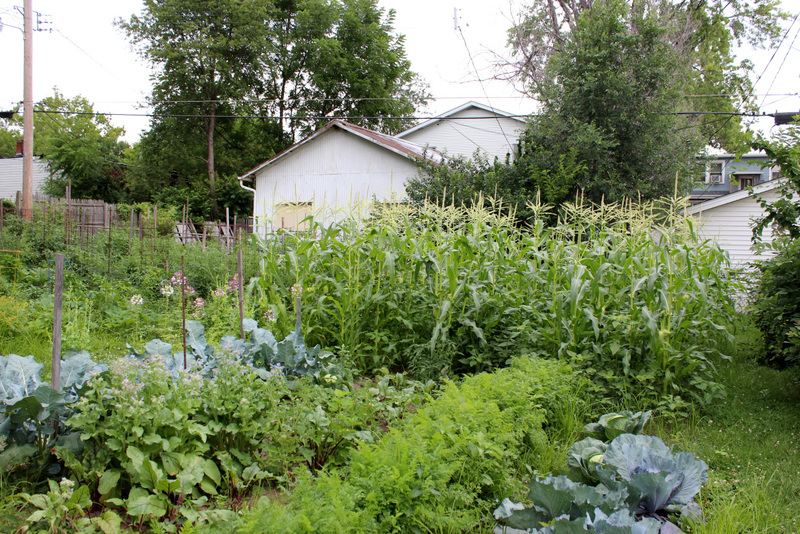 July 1st- sweet corn in the back, broccoli, beets, carrots, and cabbage in front. 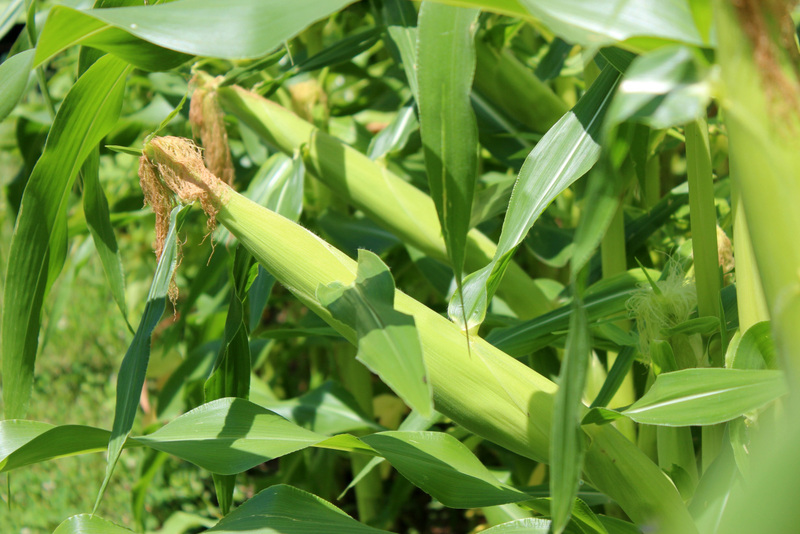 We just ate the first of the sweet corn yesterday and it was delicious! In the bigger, western plot at Amy’s we transplanted five rows of tomatoes, sweet and hot peppers, basil, a few of our wild gourd plants (second generation this year! 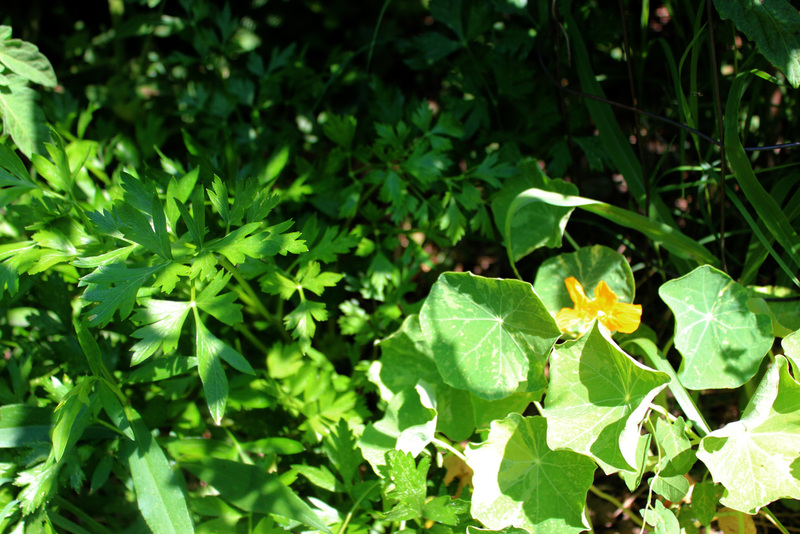 ), lacinato kale, sweet potato slips, and nasturtium. We seeded salad greens, bush beans, radishes, beets, spinach, and tronchuda kale. We got some really great harvests out of the spinach and radish row before they went to seed. 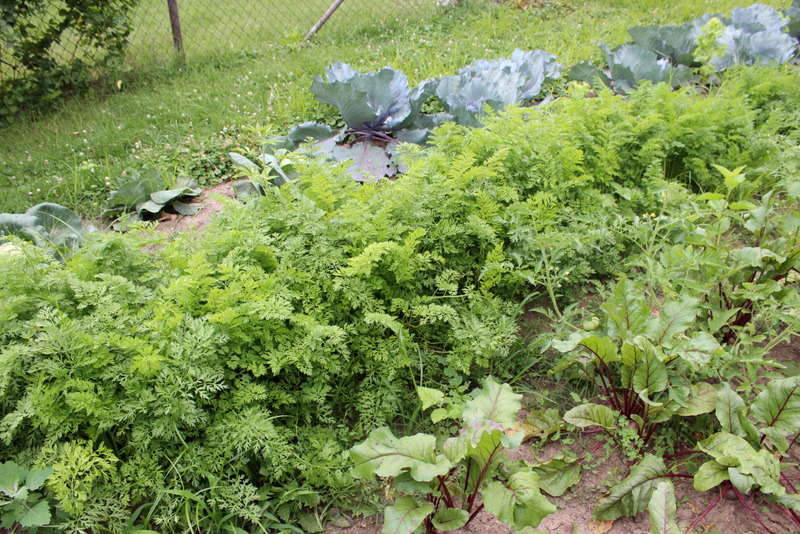 We’ve since replanted the rows with more carrots and salad greens. 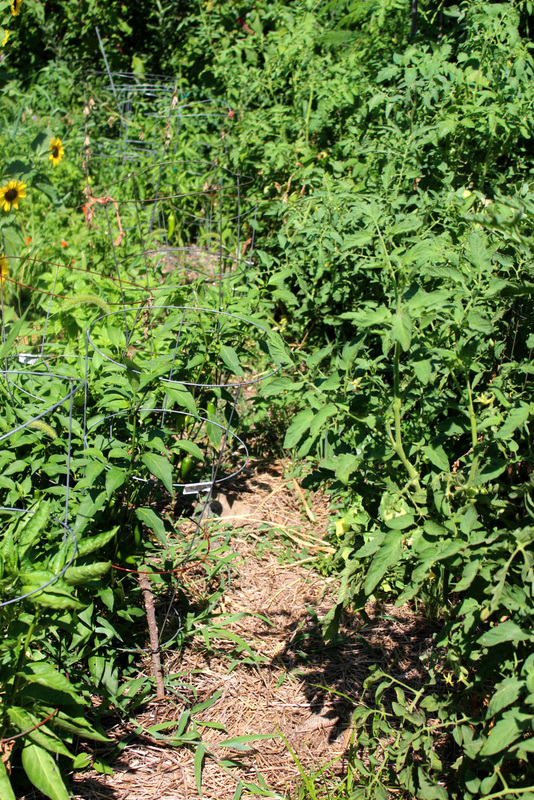 We’re using the large tomato cages we made last year from cattle fencing for our tomatoes at the Sunset Hills garden. We didn’t have enough for all the tomato plants this year, so we’re also using the Florida weave method. 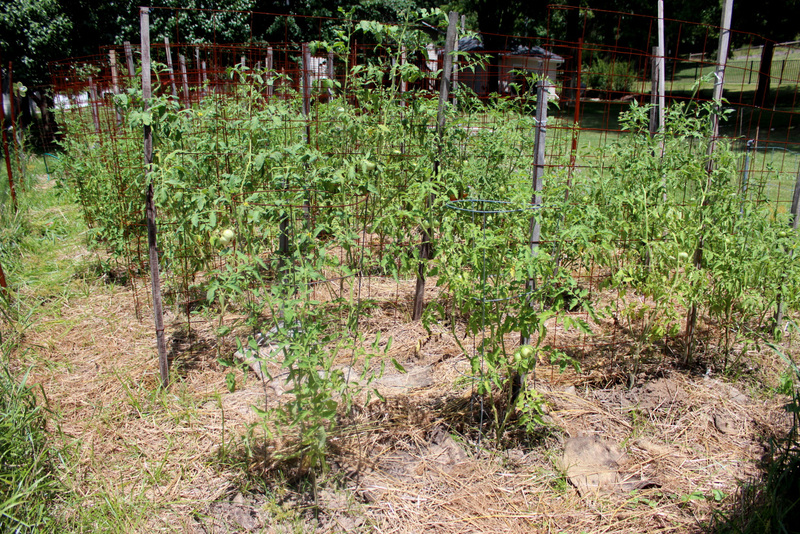 We drove in stakes between every two or three tomato plants, then used tomato twine to wrap around the stakes along each row to support the plants from both sides. 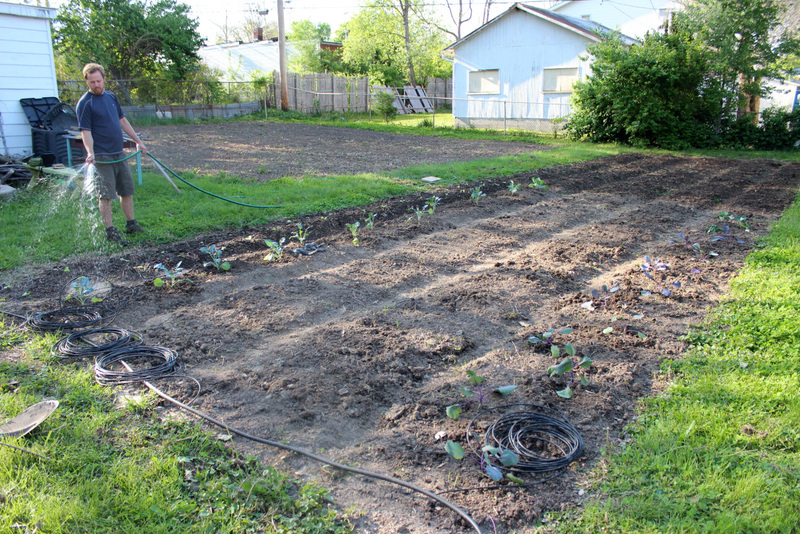 This method works best if you keep up with adding another line of twine as the plants grow. July 10th. Lacinato kale and nasturtium, two rows seeded with carrots, beets and wild gourd, peppers, tomatoes. I’d like to offer my apologies for the lack of posts lately. 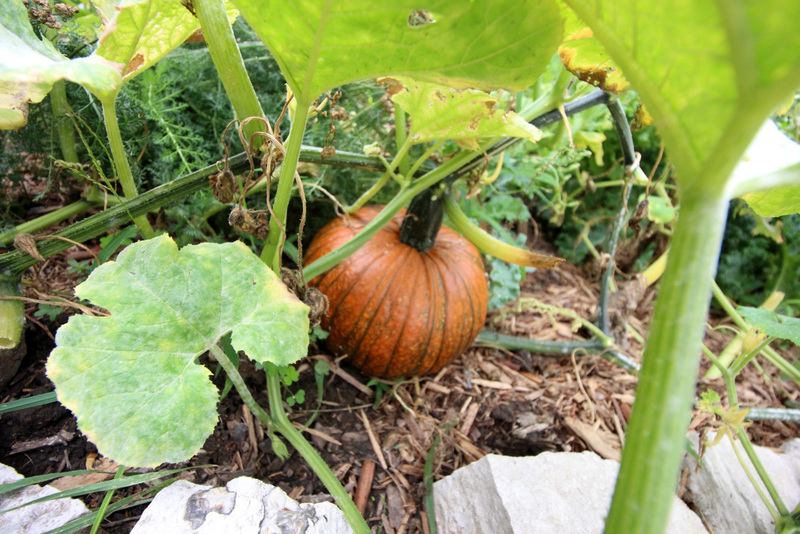 We’re still maintaining our gardens, harvesting, selling, preserving, and re-planting for fall. 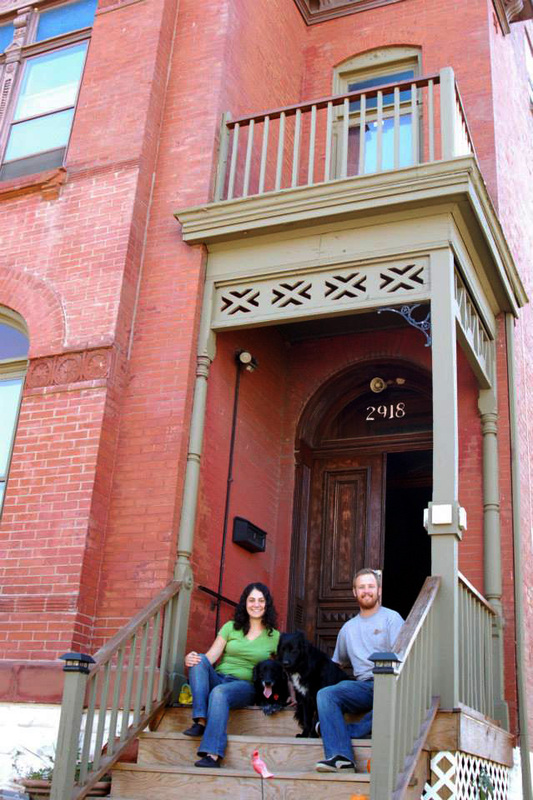 But a lot of our time has been taken up with our newest venture: buying a house! We found a house in the city in a great location that sits on a triple lot (13,320 square feet, almost 1/3 acre), completely fenced in. As luck would have it, we’d already been talking with someone in that neighborhood about farming his land (31,800 square feet, about 3/4 acre), just down the alley. 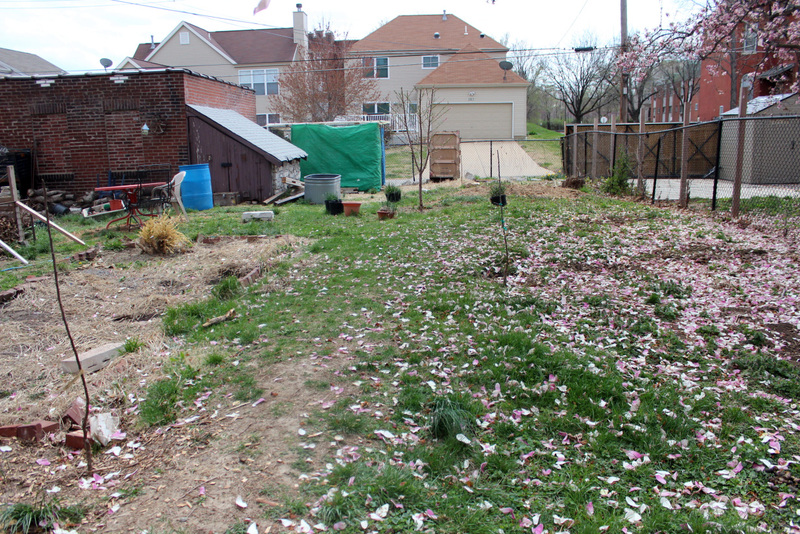 The plan is to use the large lot as our farm and to create an edible food forest, with room for the chickens, dogs, and an outdoor kitchen in our yard. It’s going to be a lot of work, on top of some indoor renovations, but we’re so excited! 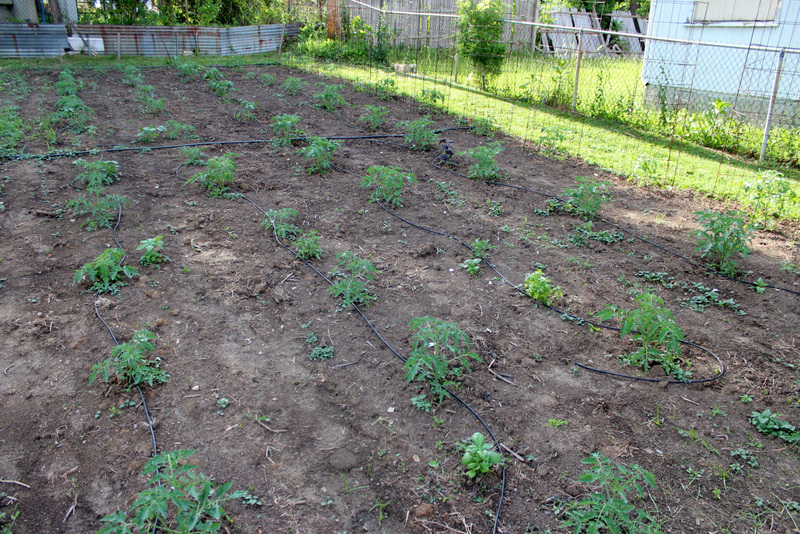 We planted our Sunset Hills tomato plot in late April this year, earlier than any other tomatoes we planted. With the cold, wet spring we had, they’ve actually fared worse than their counterparts planted in May at Amy’s place and Iowa Ave. We’ve learned our lesson- planting too early, even if it’s after the traditional planting date (April 15th in our region), doesn’t necessarily get you a head start. The good news is that our major harvests will be staggered- we’ll get a flush of ripening here when some of our other plants will be slowing down. 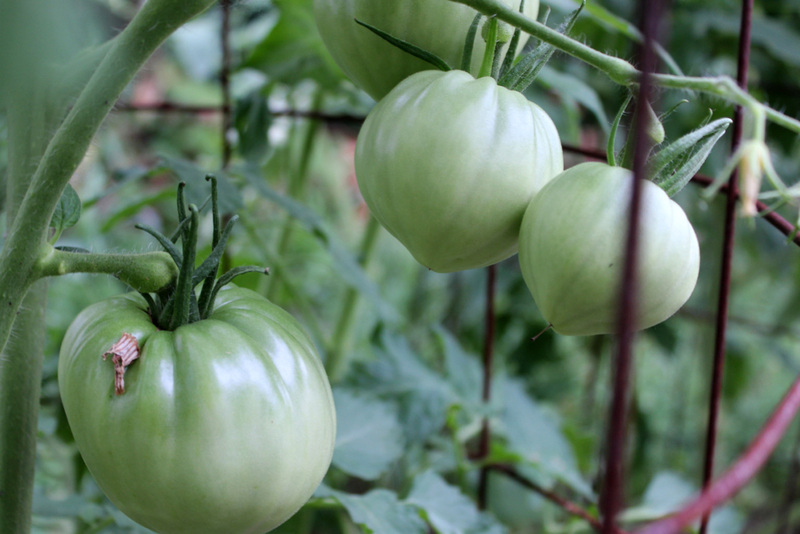 There are plenty of green tomatoes. I fertilized with a high-phosphorous organic fertilizer over the weekend, so we should see more production from that, too. The Cherokee Street International Farmers’ Market is in full swing! 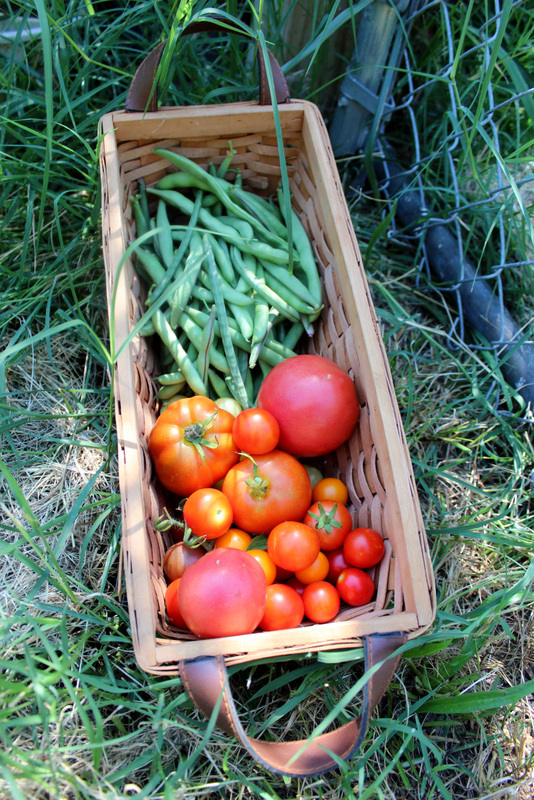 Today we sold cucumbers, zucchini, jalapenos, tomatoes and cherry tomatoes, green beans, purple carrots, garlic, sprouts, cut flowers, and herbs. 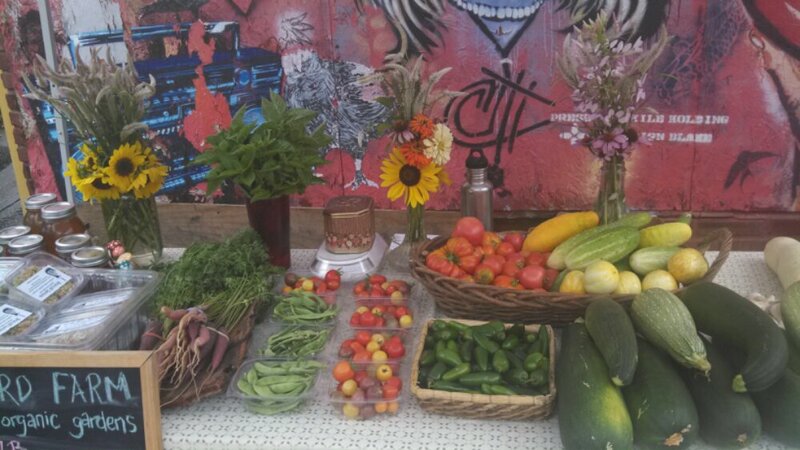 The market runs every Friday from 4-7pm at 2647 Cherokee Street (in front of the stencil wall next to I Scream Cakes). Come see us next week! 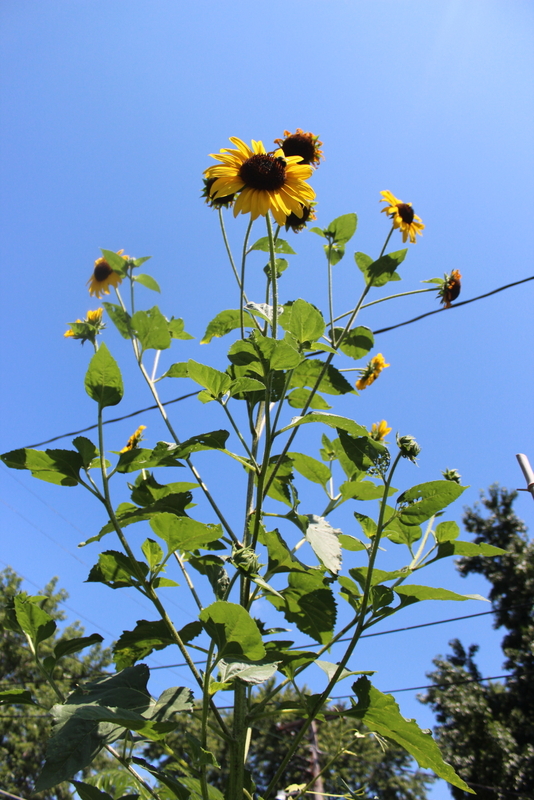 Sunflowers grow here every year- thanks, Dave! 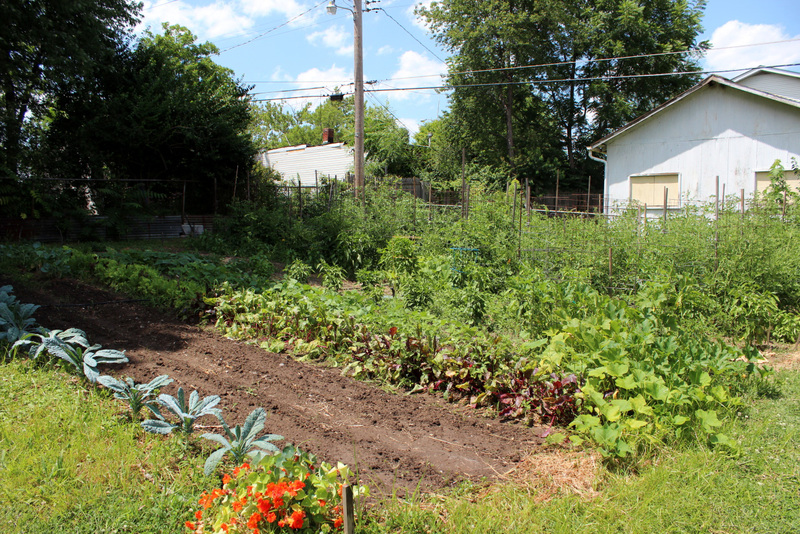 This is our third season working on the Iowa Ave. garden, and it’s going well. Originally designed with raised beds, we’ve since tilled up larger sections to get more planting space and try to deal with the ever-invasive grass. 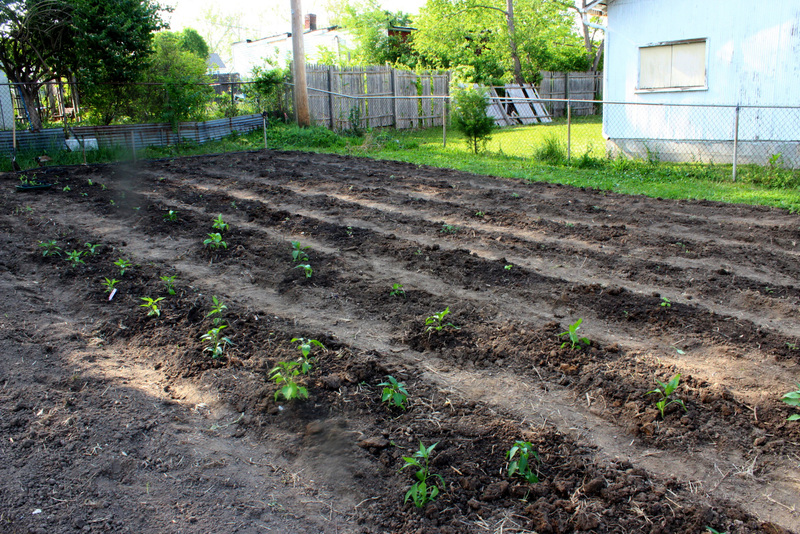 Newly tilled this year is the back section, which now boasts a dozen healthy tomato plants, lots of peppers, and a variety of herbs. 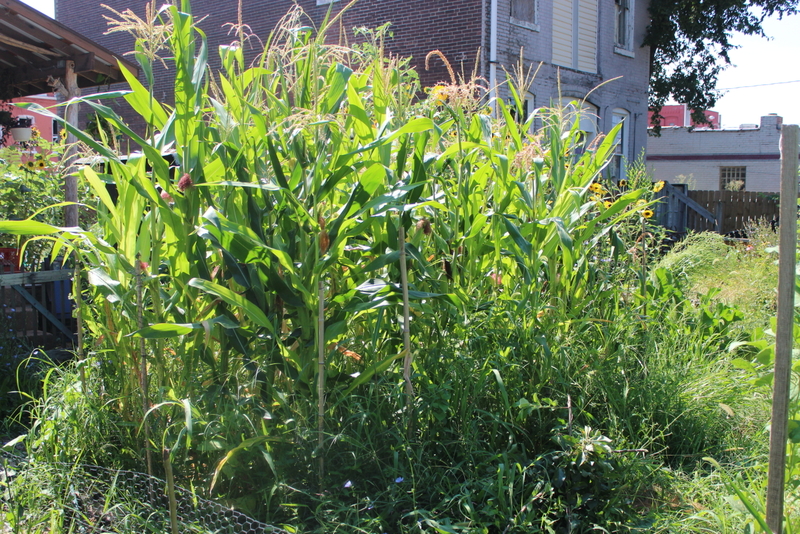 Popcorn is thriving in the tilled middle section of the garden. Also in the middle section, three varieties of beans, including bolita and black beans. We saved seeds from an unknown variety last year. 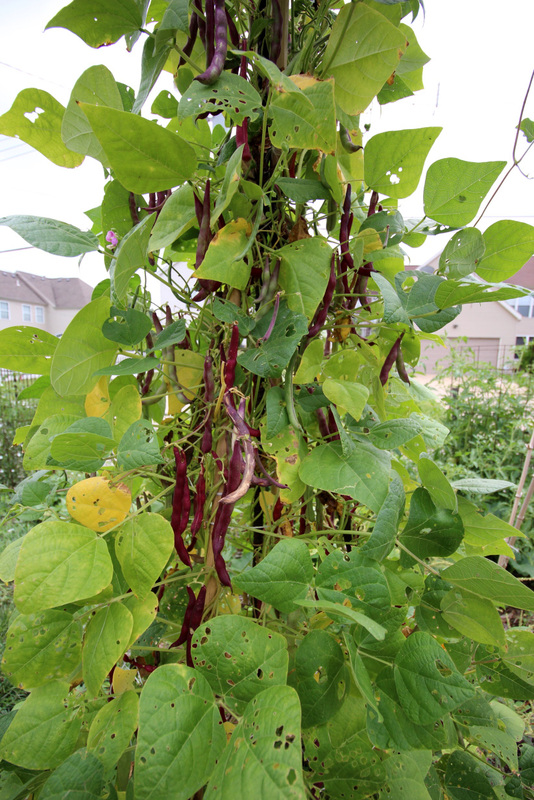 Long and skinny with small striped beans, they’re great as green beans when young. We’re hoping they’ll be good for dried beans, too. The teepee trellis sits in the southwest corner of the lot, which we dug out by hand. 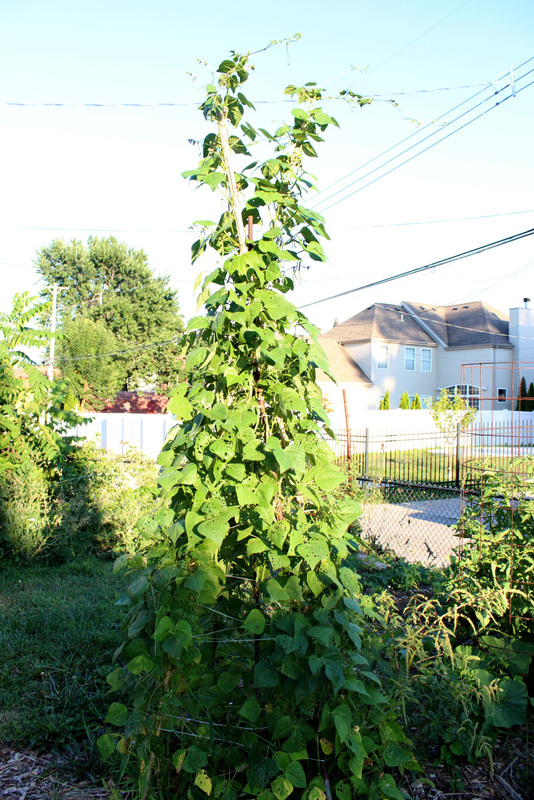 It’s planted with more pole beans. The view from inside. Yes, there are beans all the way at the top, very much out of reach without a ladder! The raised beds have eggplant, edamame, cucumbers, carrots, garlic, beets, flowers, and lots of plants going to seed. Soon we’ll be replanting for fall! We have two new beds this year. 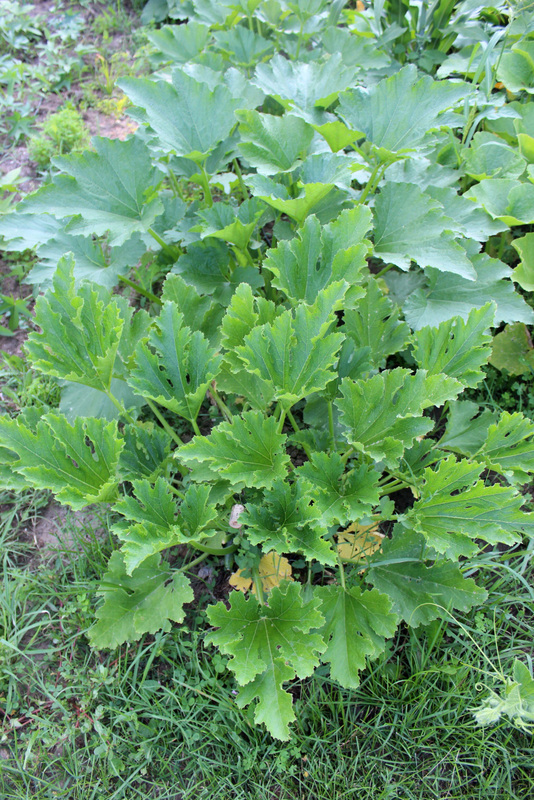 This one was planted with ginger. 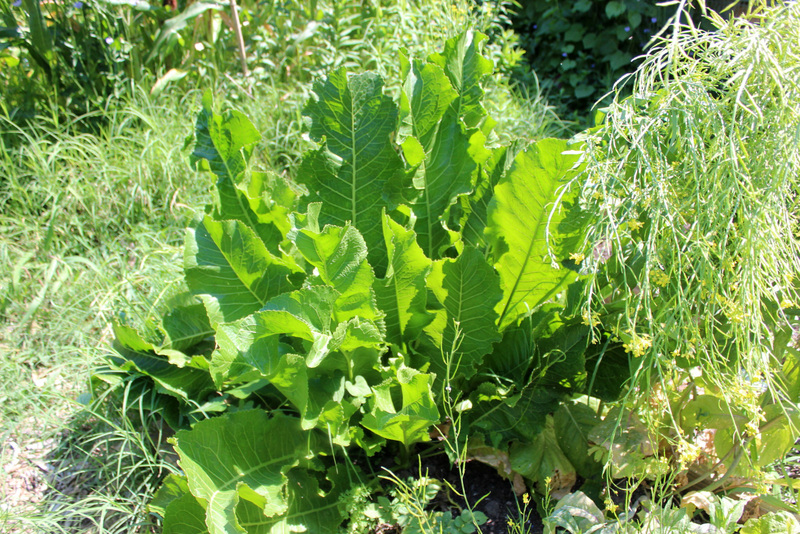 Horseradish in the other new bed, along with some mustard going to seed. I do most of the harvesting on Fridays in preparation for the Cherokee Street International Farmers’ Market but we harvested some goodies today, too. I also started to dig up some of Dave’s hardneck garlic we’d transplanted into one of the beds earlier in the spring. Temperatures are predicted to be much lower tomorrow and Thursday, so we’ll be back at it some more! We got up on the garage roof to take some aerial photos today. 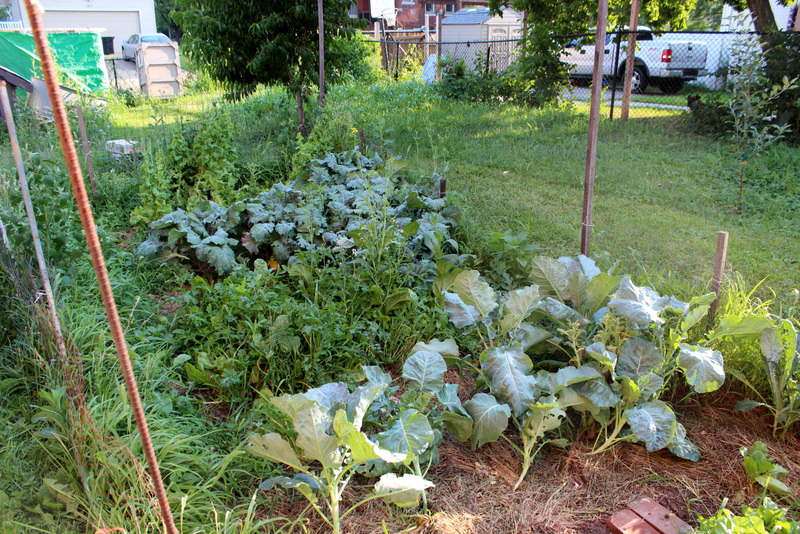 This is the west side of the large plot, which includes our spicy salad mix, cabbage and cauliflower, cucumbers, butternut squash, zucchini, sweet potatoes, banana squash, pumpkins, and melons. 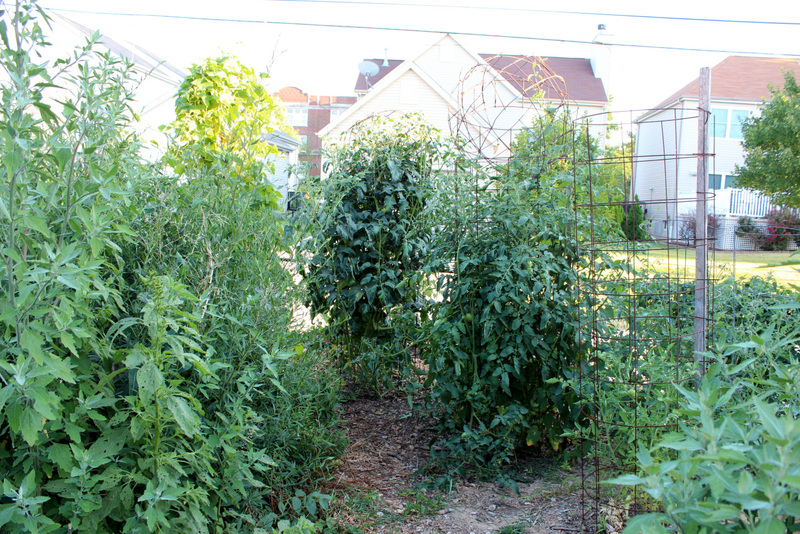 The tomato/pepper plot to the east. 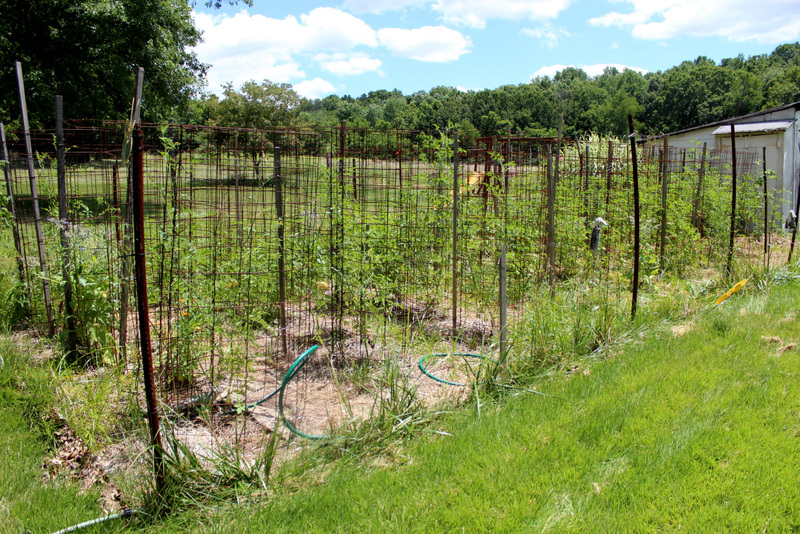 We’re trellising our tomatoes using the Florida weave system this year- our first time using this method. 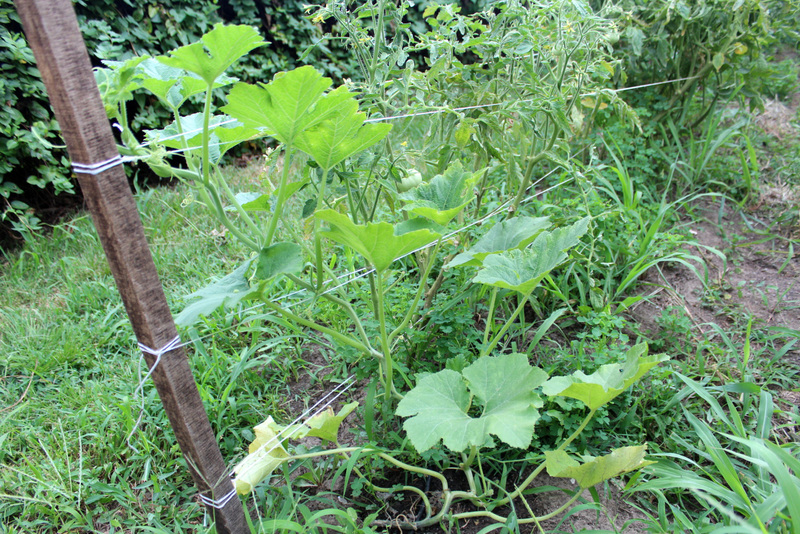 Using stakes every 2-3 plants, you wrap tomato twine around the plants as they grow. I like it so far, but you have to keep up with it! This photo was taken 2 weeks ago; you wouldn’t believe the growth since then! 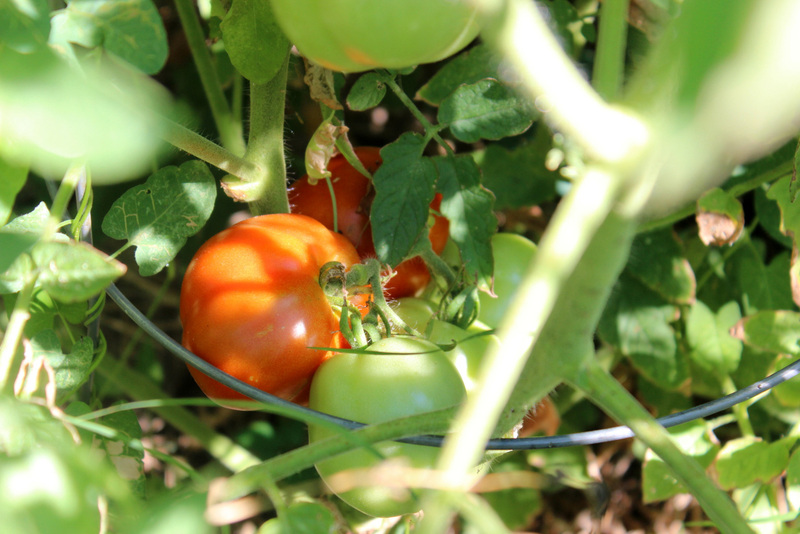 Speaking of tomatoes, our Genoveses are starting to ripen. 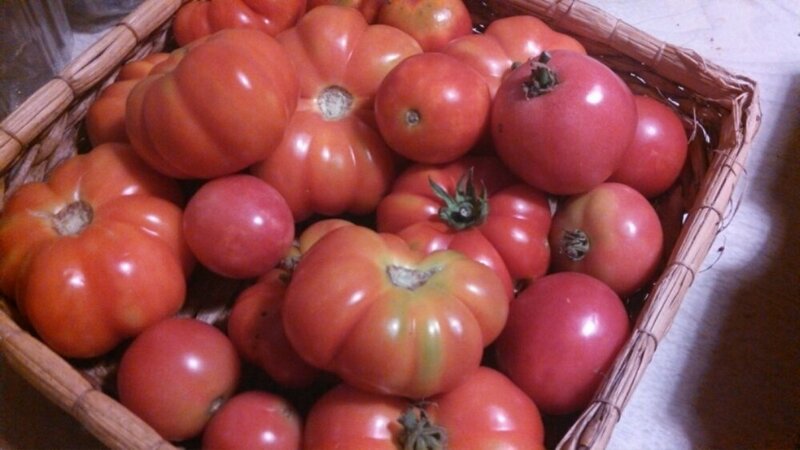 They usually grow singly, but it sure is fun when they grow in big bunches like this one! 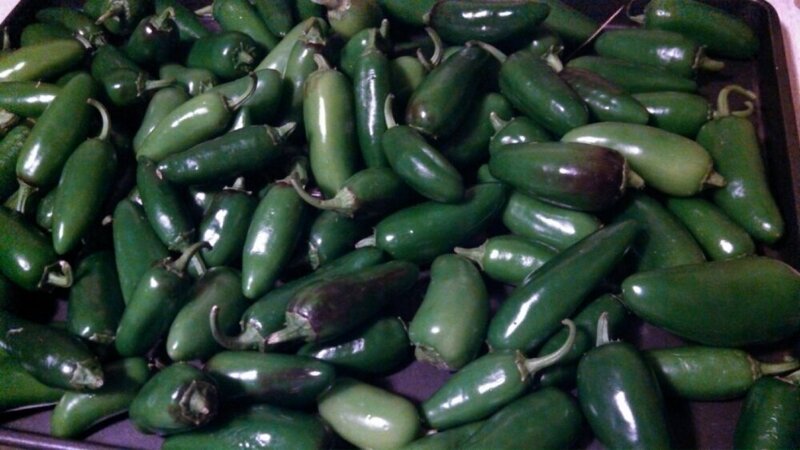 Our jalapeno pepper plants are producing prolifically this year! 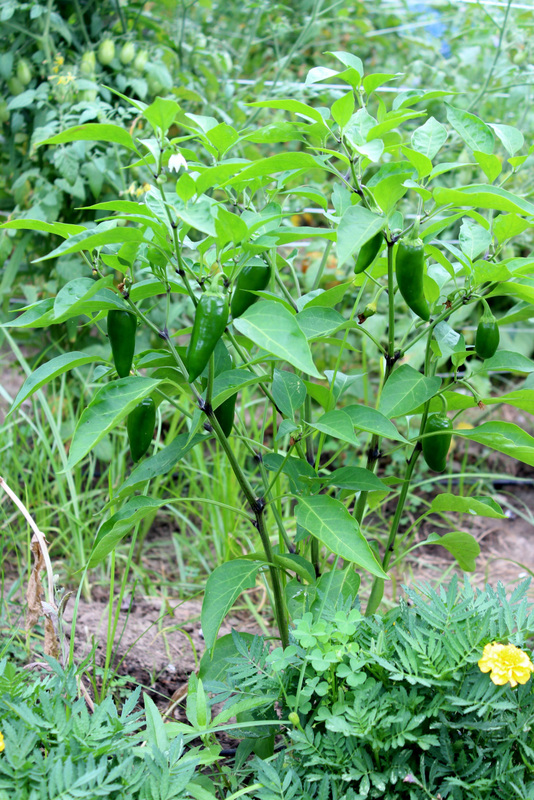 We picked over 100 peppers last week for the market. 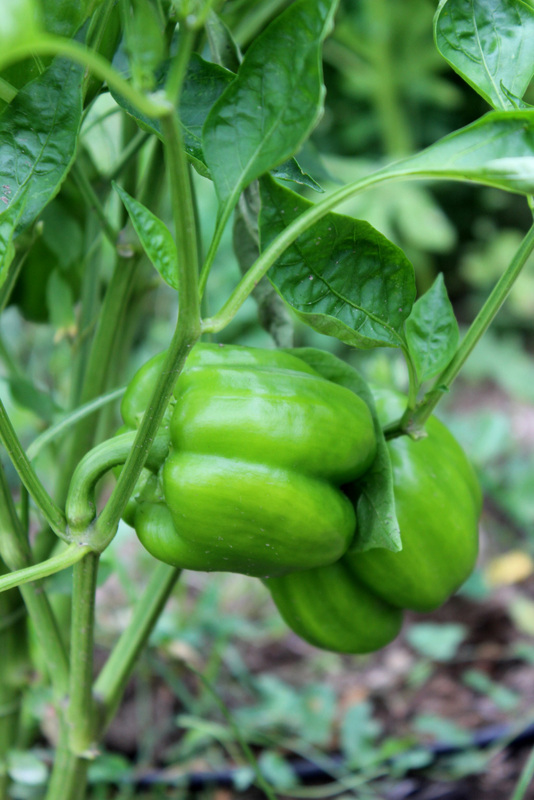 Bell peppers are getting there, too. 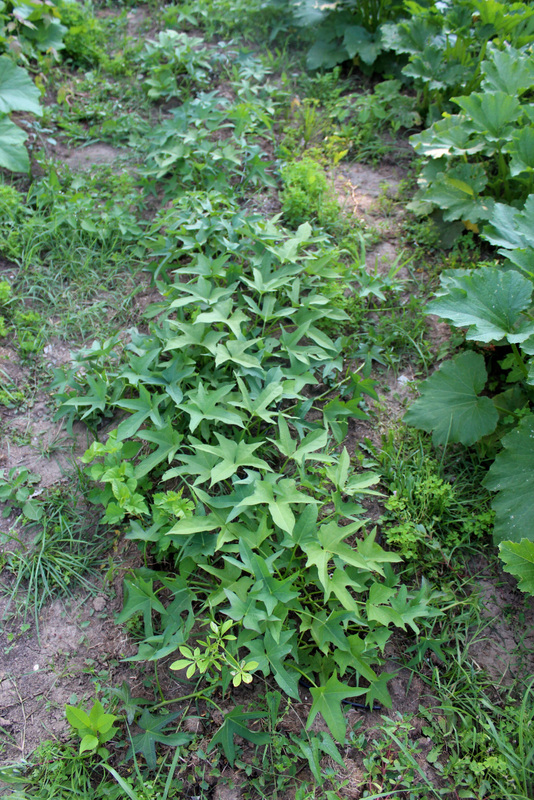 This is our wild gourd plant, propagated from seed from one of the dried gourds we found over the winter. 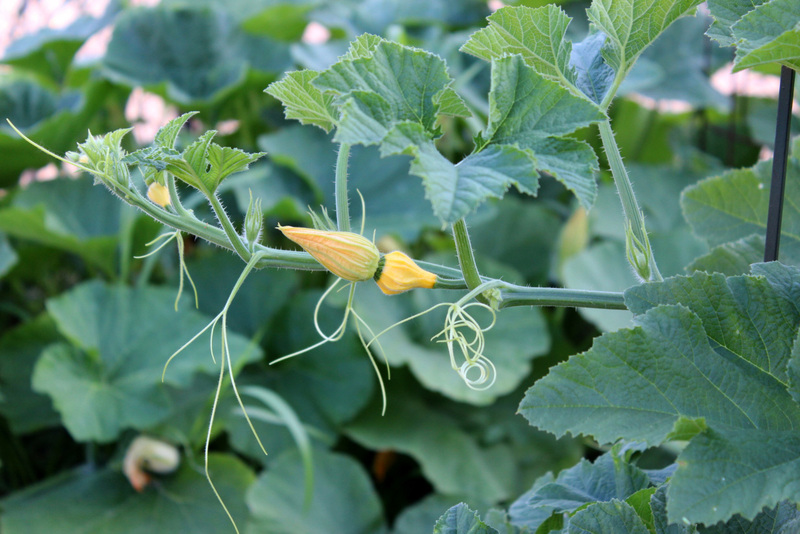 Super excited for our namesake gourds! 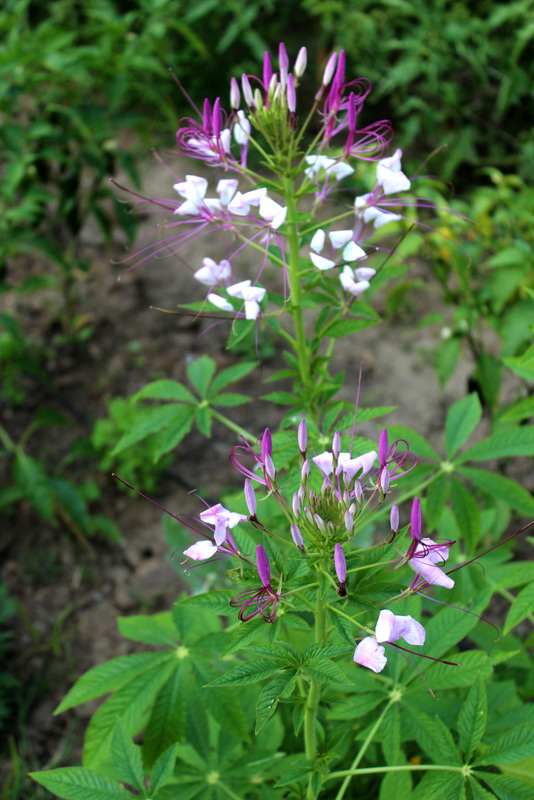 This is Eric’s favorite flower, cleome. 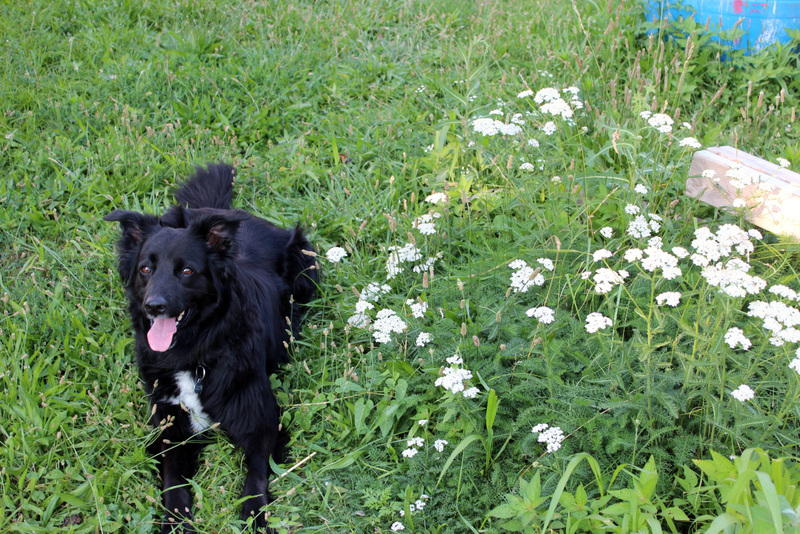 We like to interplant lots of flowers in our garden plots- not only are they beautiful and make great cut flowers for bouquets, but they attract beneficial pollinators, too. 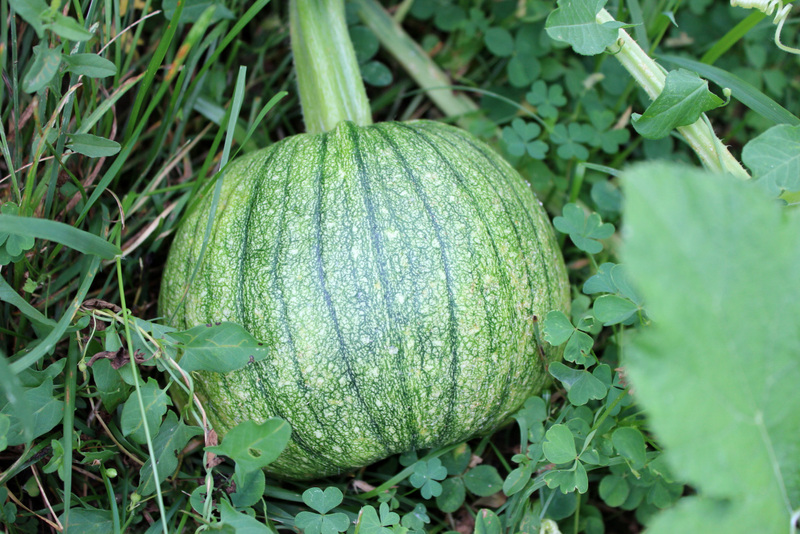 Meanwhile, in the plot to the west, we’ve got several varieties of pumpkins growing- good for cooking and carving! 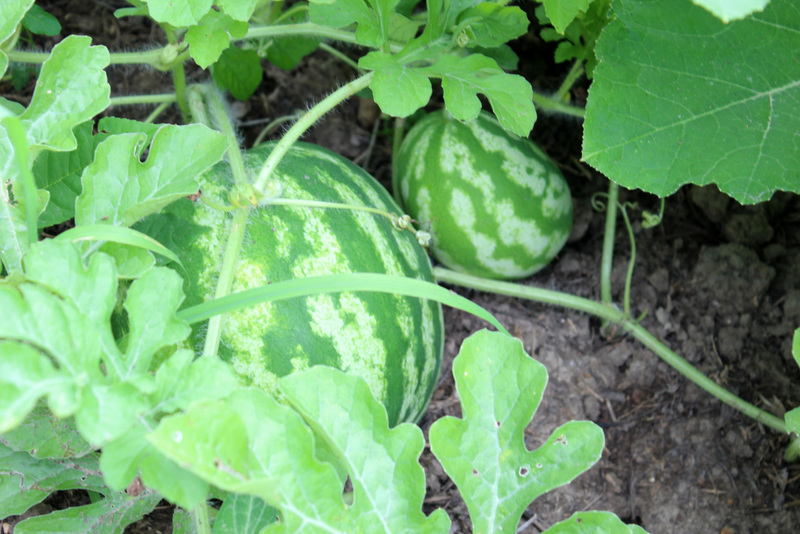 Also lots of melons! Mostly watermelons but also some cantaloupe. 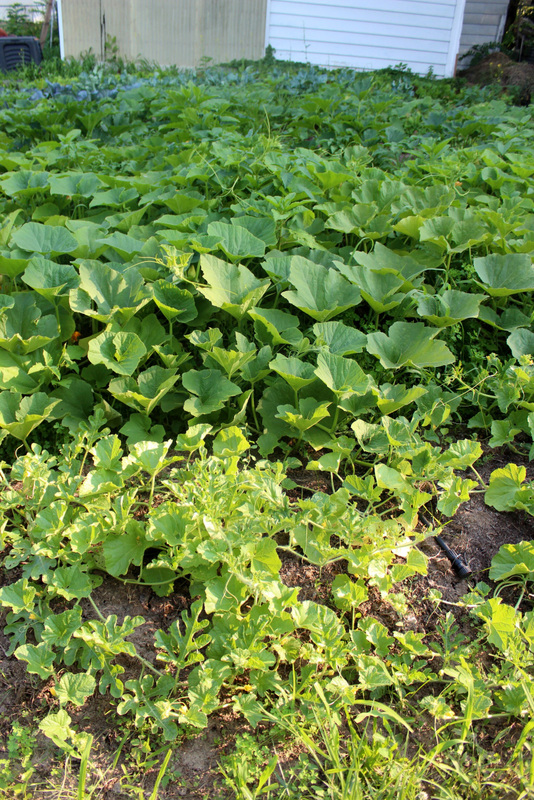 Melon vines in foreground, followed by pumpkin, and banana squash taking over the background. We’ve got two rows of zucchini, black beauty and a gray variety from Baker Creek. So far we’ve harvested ~25, with more maturing every day. 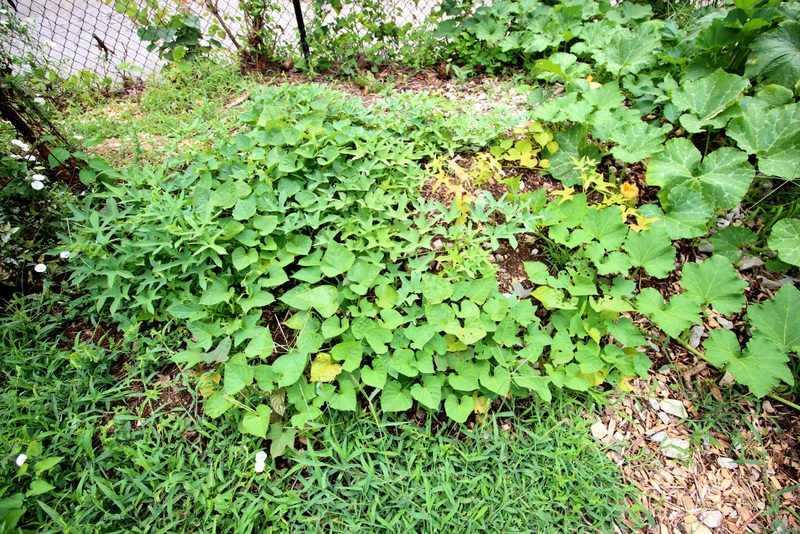 Our row of sweet potatoes is filling out nicely. We have more planted elsewhere, too. And here’s the butternut squash row. 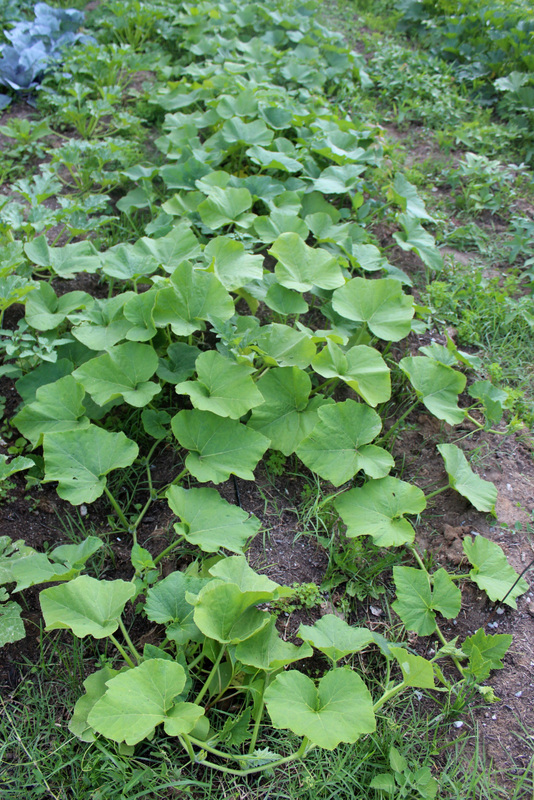 We planted these a little later than our other squash rows, and there are already a few baby squash starting. We love growing garlic! 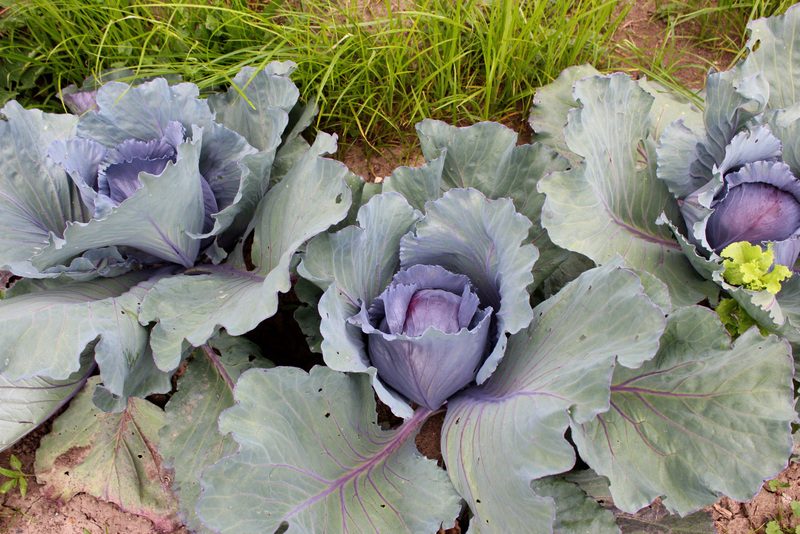 It’s one of the easiest crops we grow, requiring very little input or upkeep. 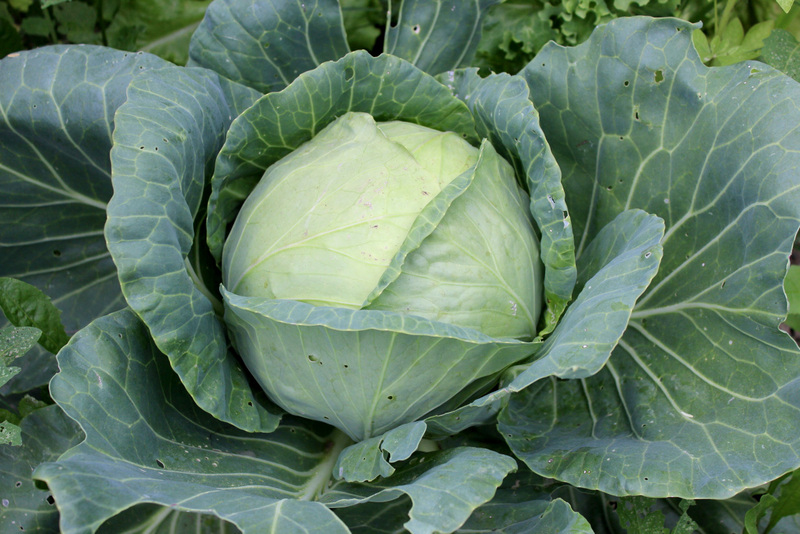 We use it in nearly everything we cook, and it stores well – no canning or dehydrating necessary! We harvested about half of our garlic on Sunday, about 120 heads. They’re curing in the basement on the shelving unit previously used for seedlings, with two fans directed at them to increase air flow. I’m looking forward to braiding them after they dry out a little! We’d planted this garlic last October at Sunset Hills. Three rows are a softneck variety we bought from Local Harvest, the last row has some elephant garlic and some hardneck garlic from cloves we’d grown and saved. We noticed that some of the softneck started to fall over (lodge), meaning it was time to harvest. 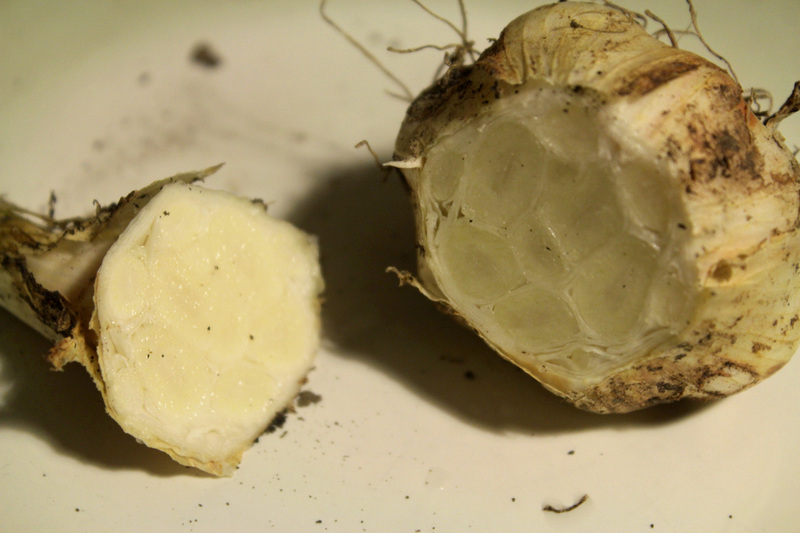 A head of softneck garlic is composed of a mosaic cloves, while hardneck garlic has a hard stem through the middle and a ring of cloves around it. This stem is where the scape comes from; softneck varieties don’t form scapes. 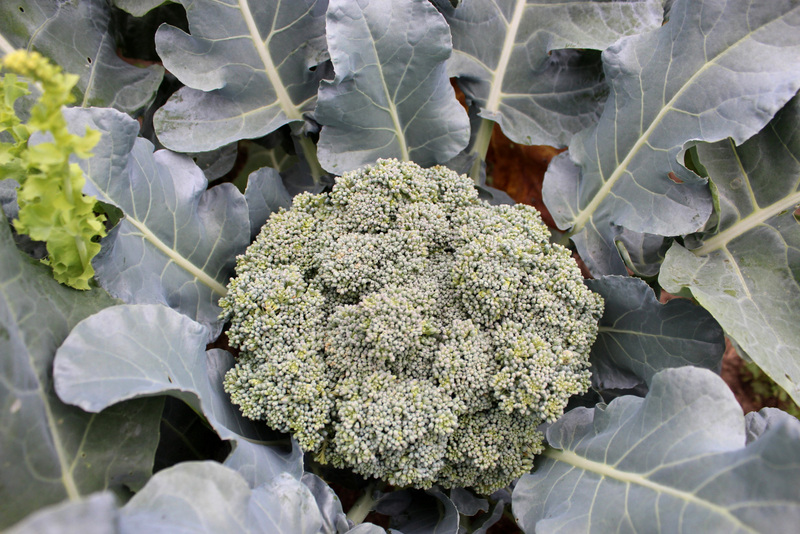 Softneck varieties grow and mature more quickly and are said to store better than hardneck but have a milder flavor.